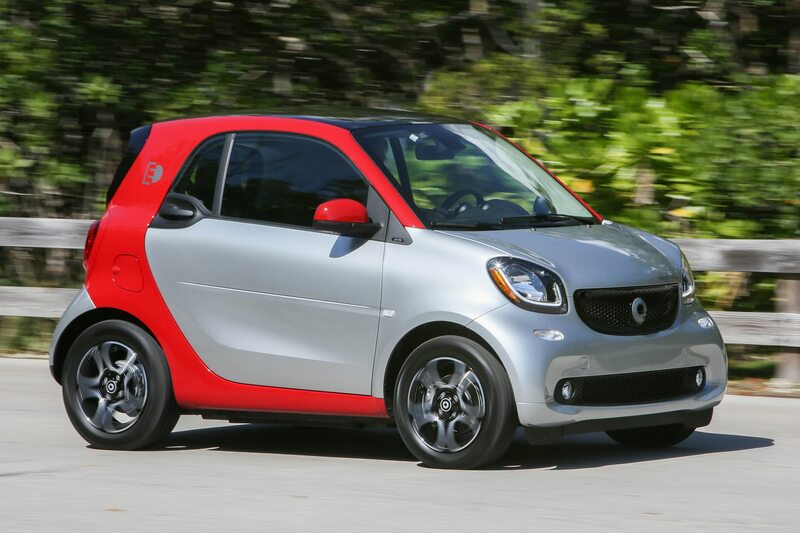 Automakers beware. 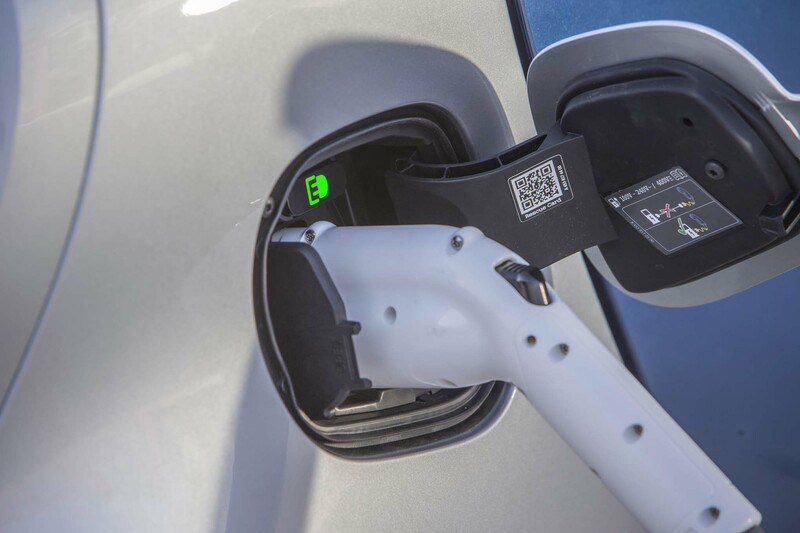 As the Chevrolet Bolt begins rolling off transports and into dealerships, it’s becoming clear that there’s an electric-vehicle paradigm shift underway. 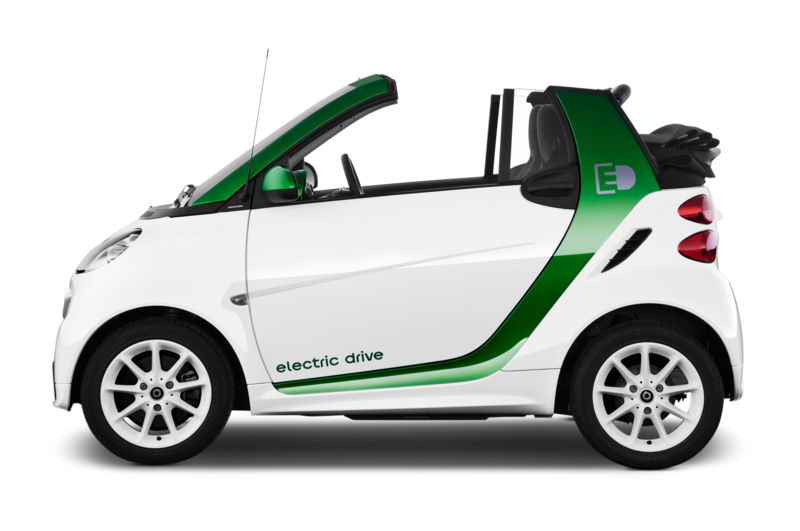 If your battery-powered car doesn’t have a range of 200-plus miles and cost around $30,000, you’d better have a convincing alternative narrative. 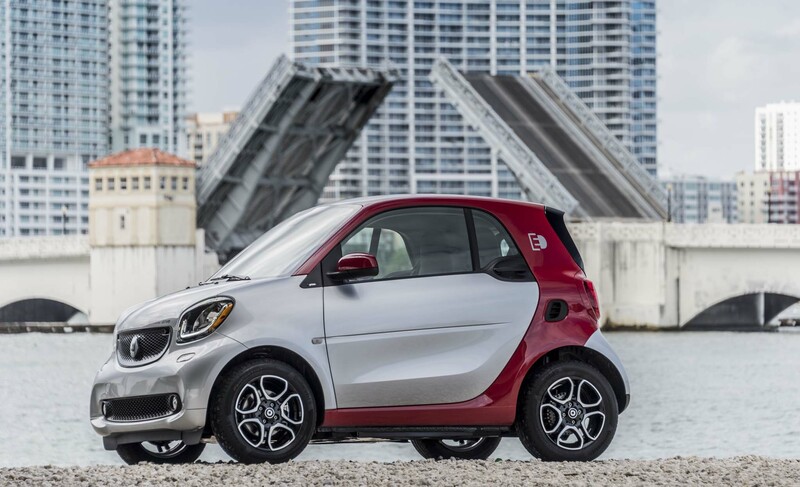 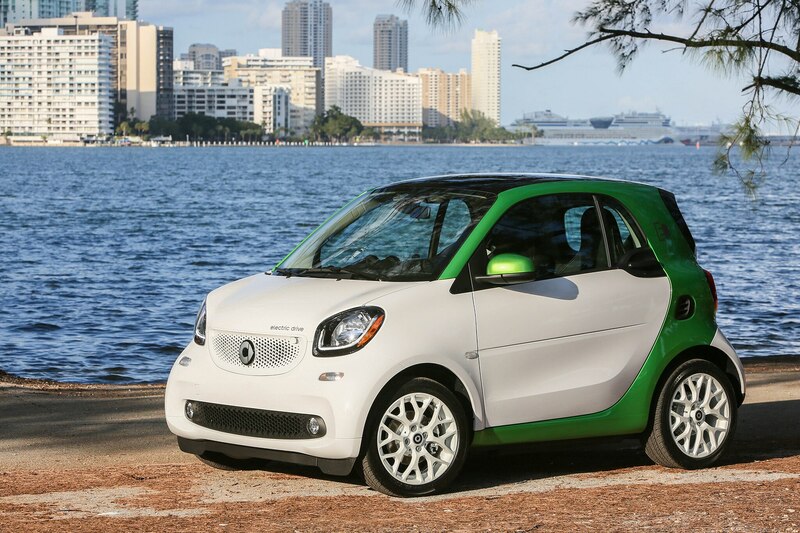 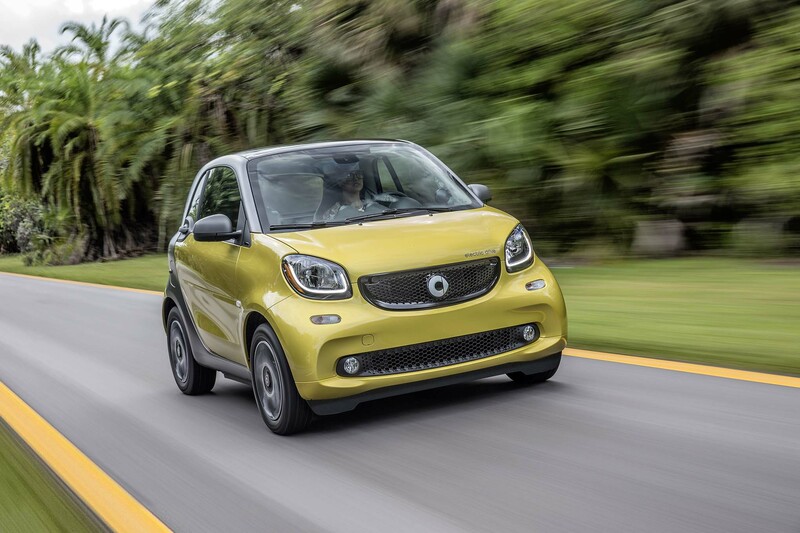 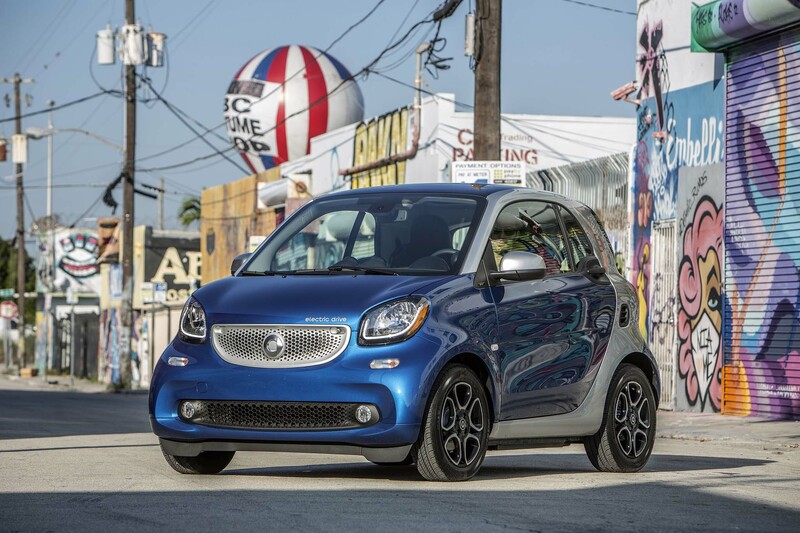 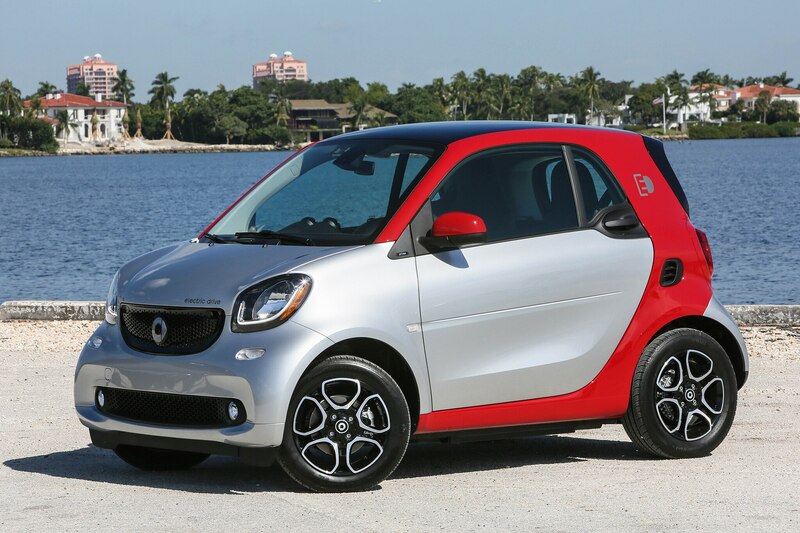 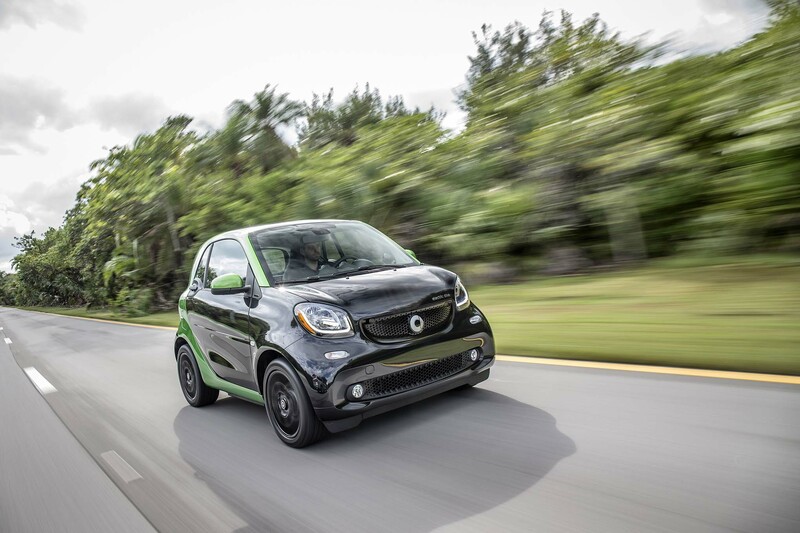 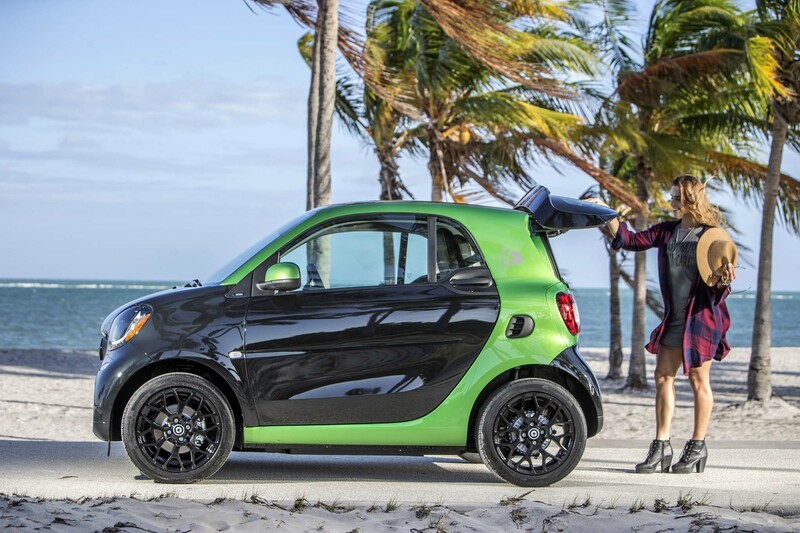 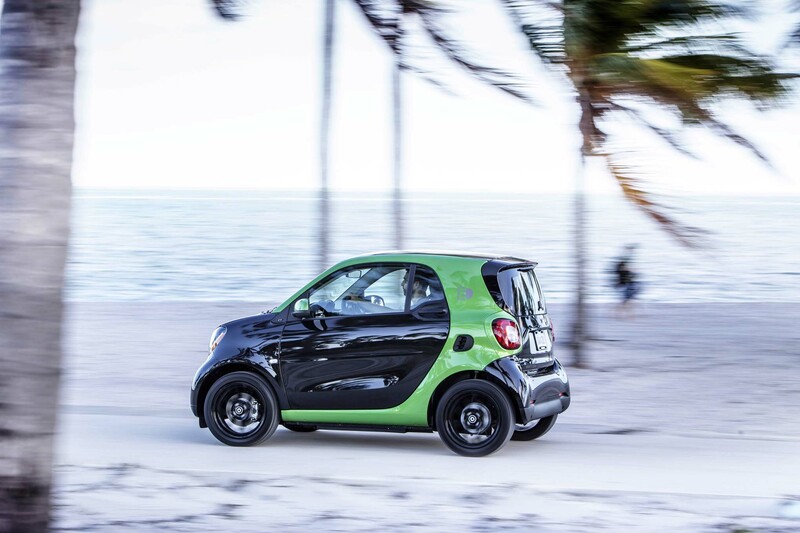 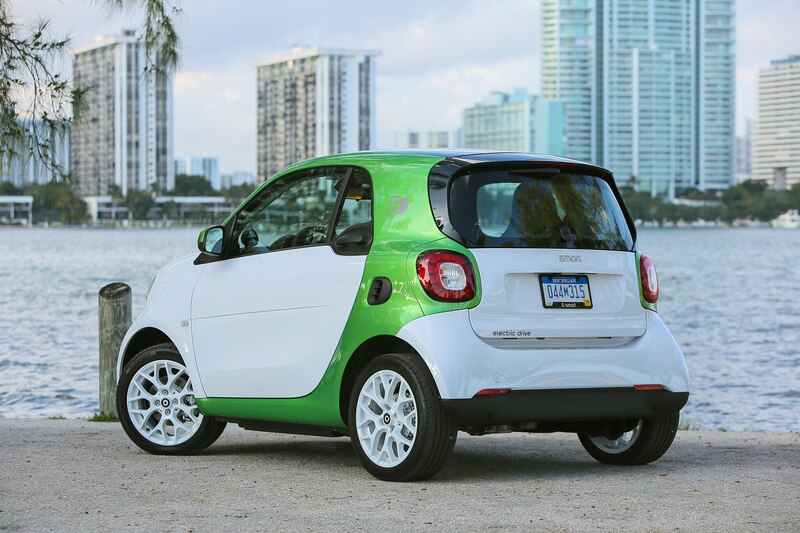 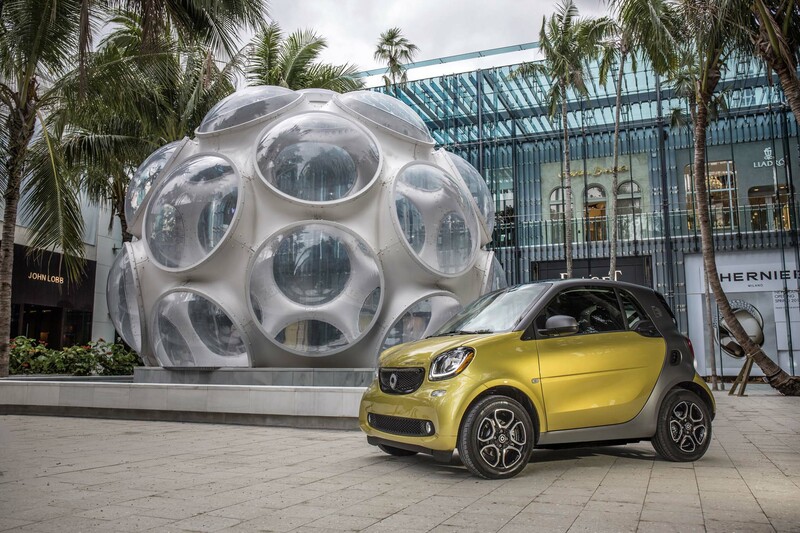 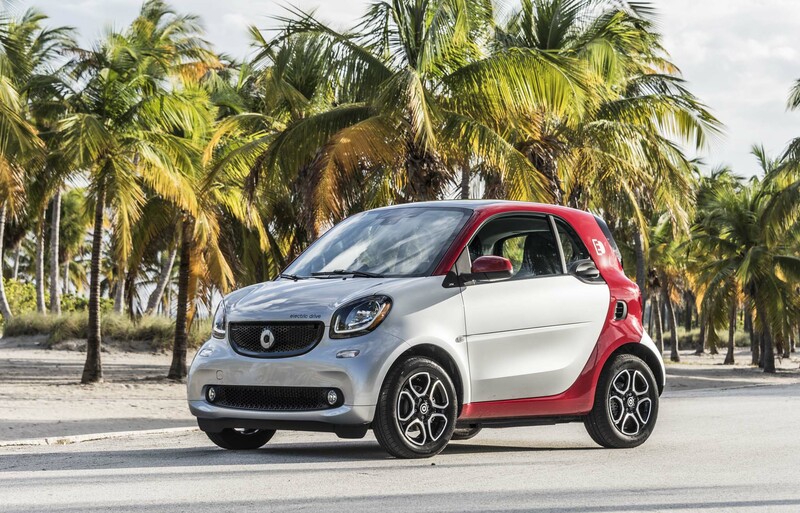 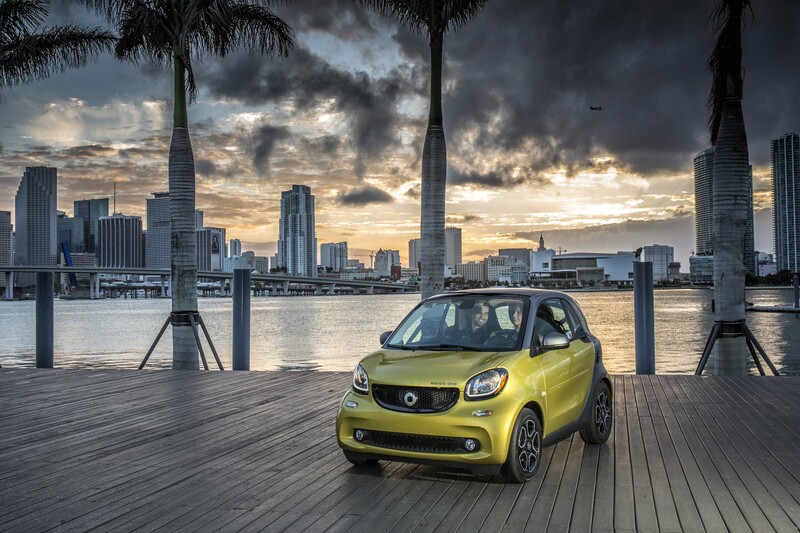 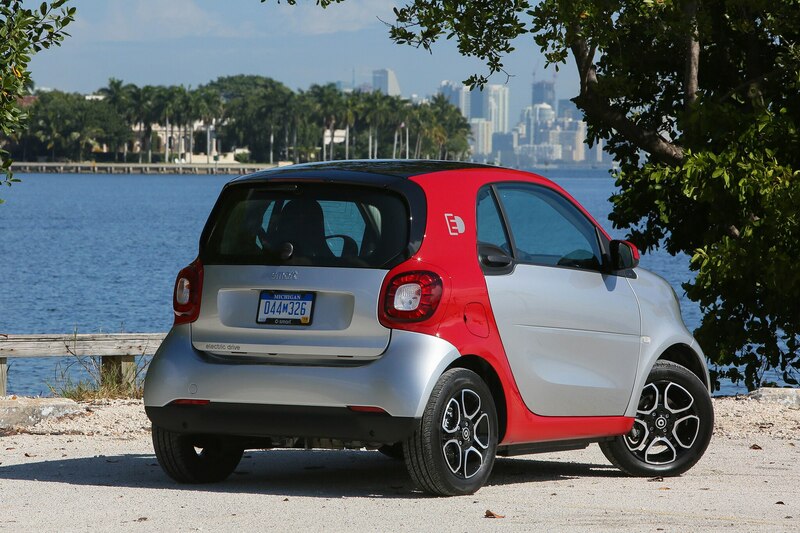 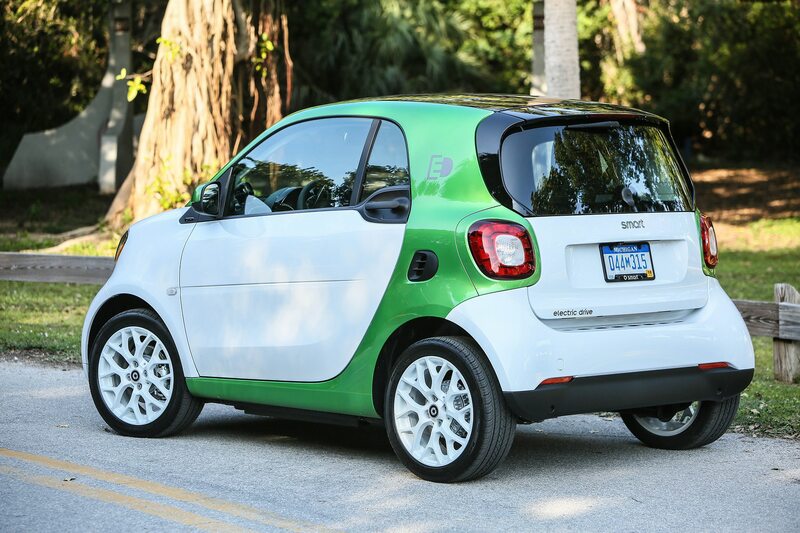 This is more than likely why Mercedes-Benz brought us to the heart of Miami to test its 2017 Smart Fortwo ED. 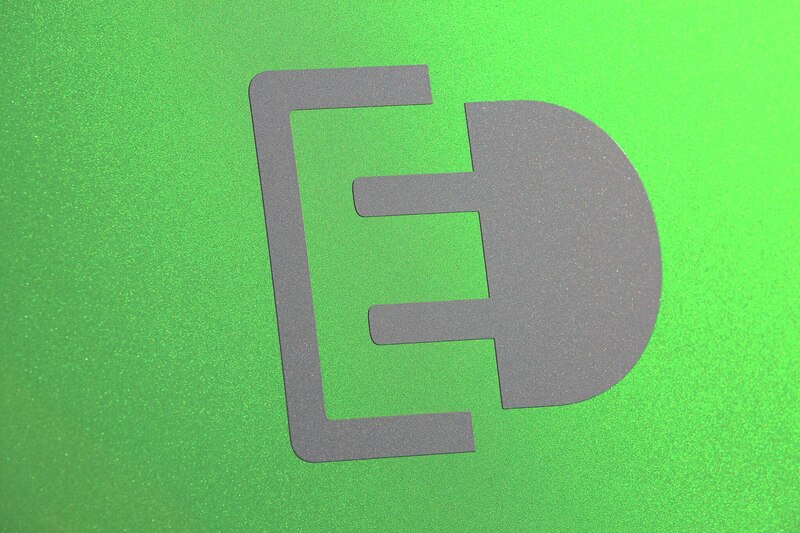 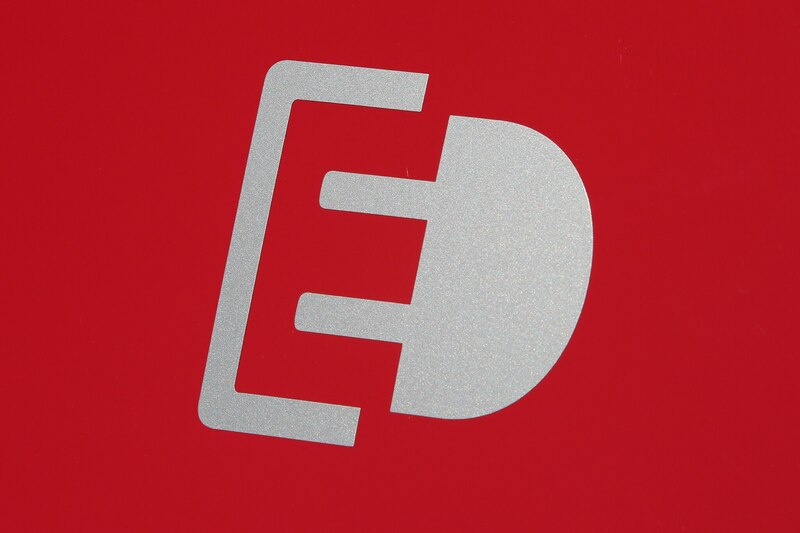 (That’s Electric Drive and, yes, we’ve all had fun with ED’s other meaning.) 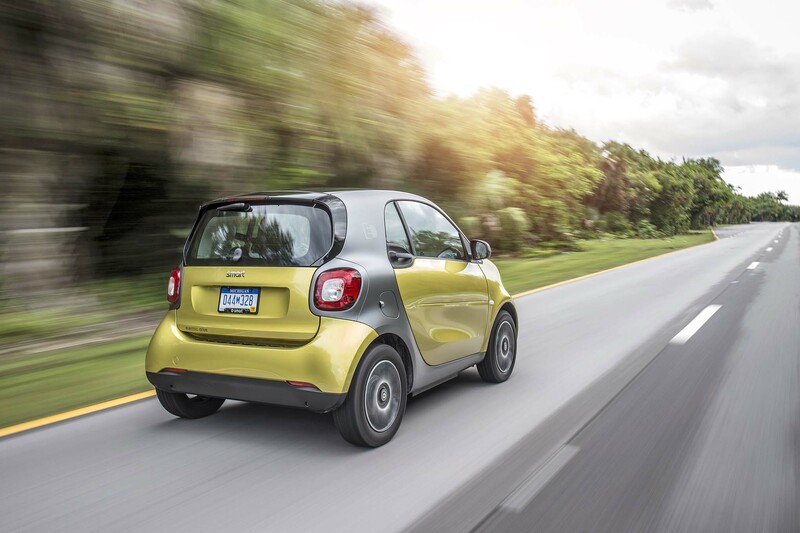 No winding mountain highways this time; we’re in for busy city traffic instead. 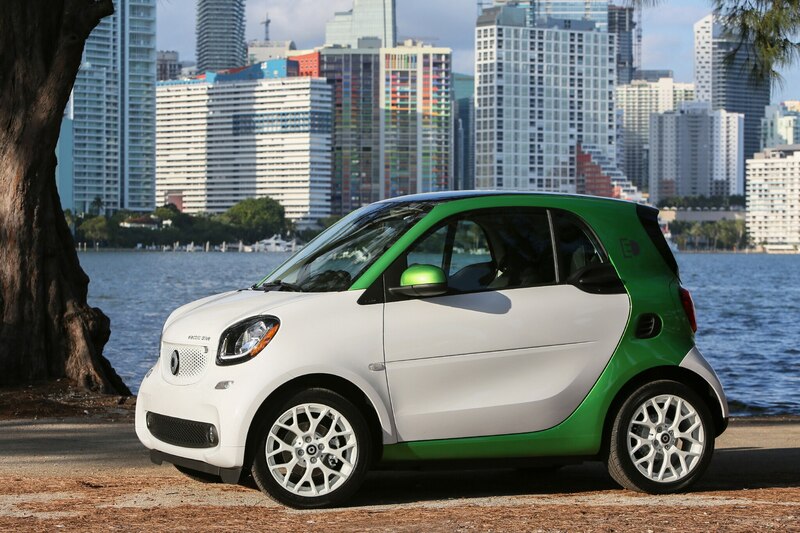 Catchphrases like “urban mobility” and “local emissions-free driving” highlight the product presentation. 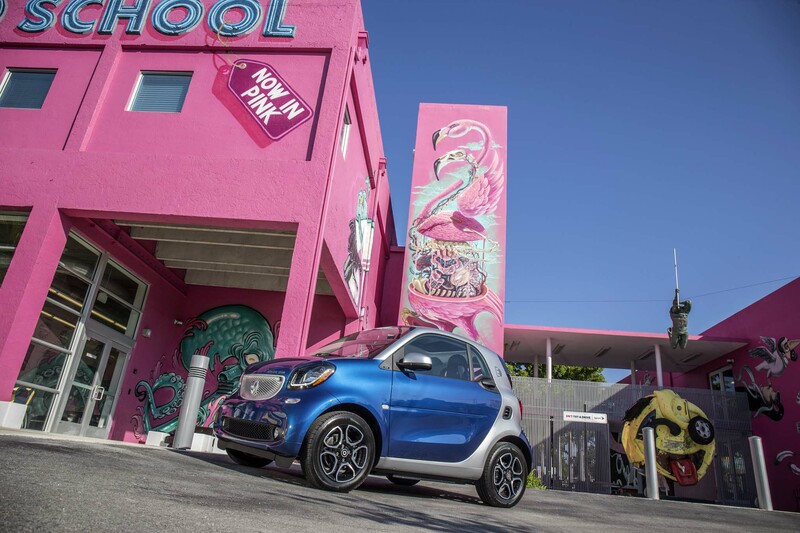 There’s no talk of how the Fortwo ED handles in corners, just that it’s “agile and lively,” with a tight, 22.8-foot turning circle. 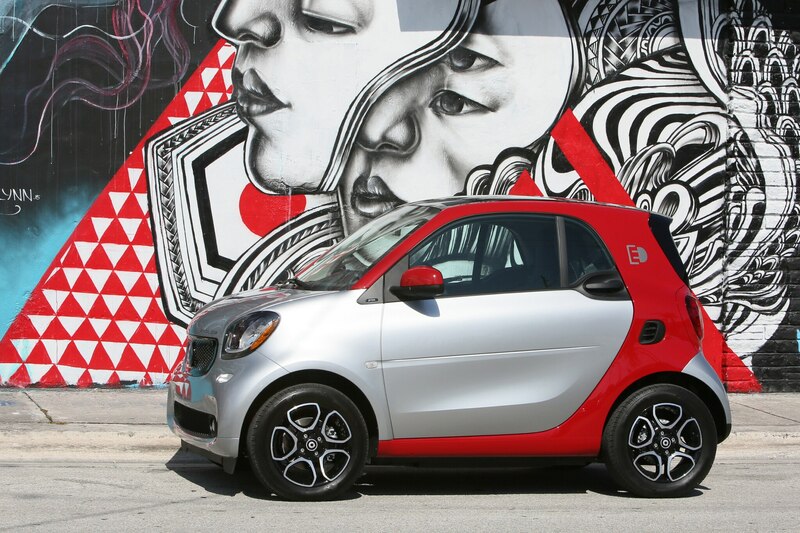 The theme is decidedly urban-centric. 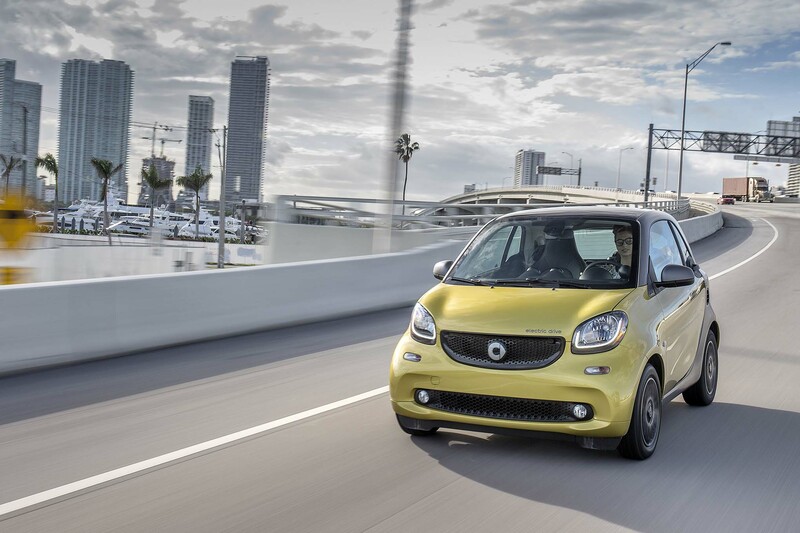 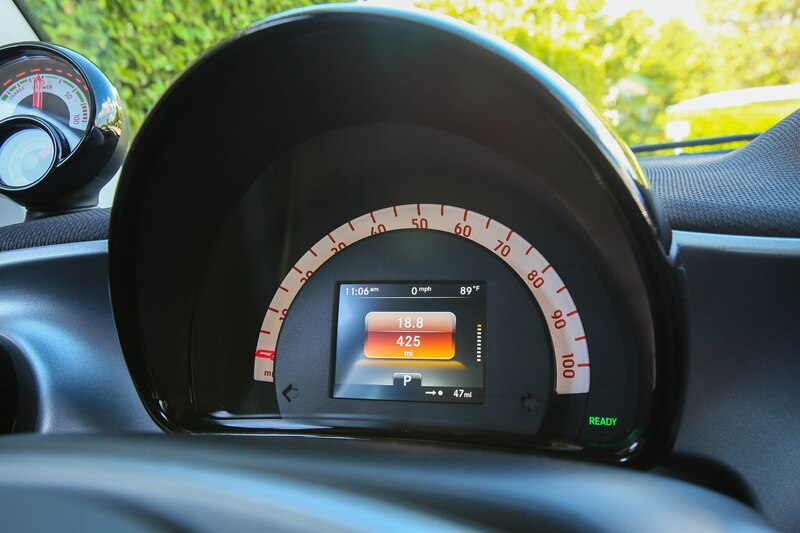 Here are the basic Smart Fortwo ED facts: Range is 75-80 miles. 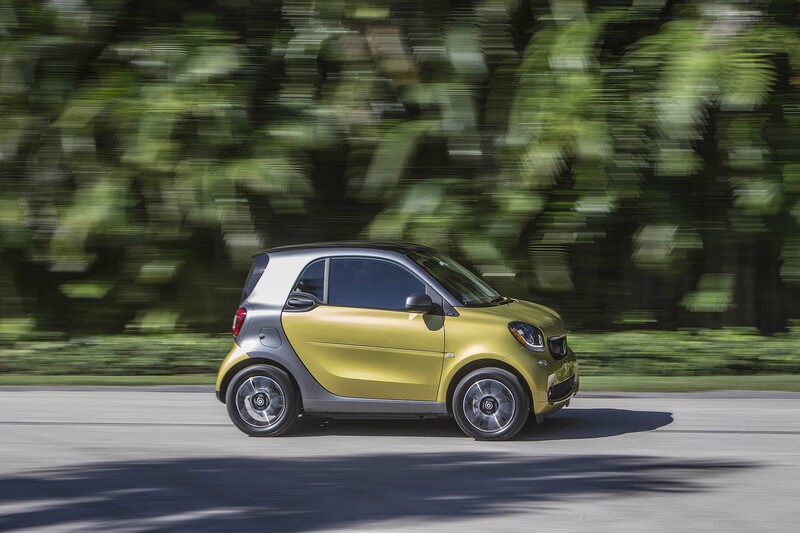 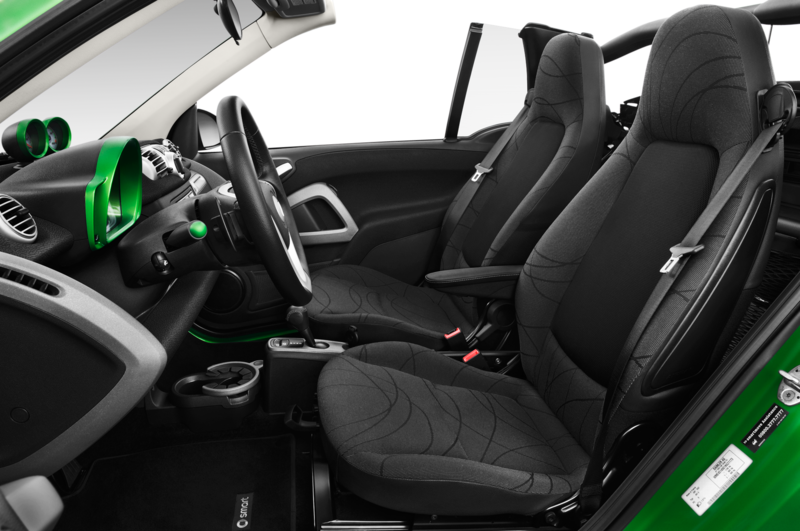 Its 0-to-60-mph time is a leisurely 11.4 seconds for the fixed-roof model and 11.7 for the cabrio. 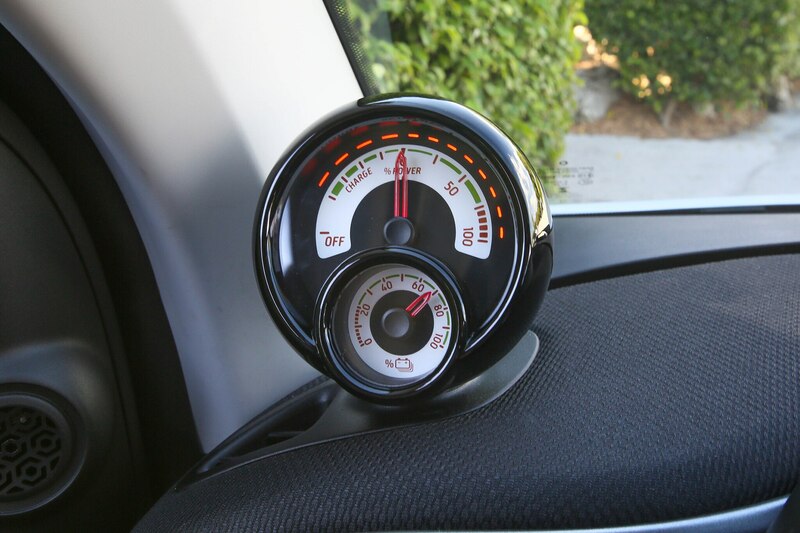 Top speed is 81 mph. 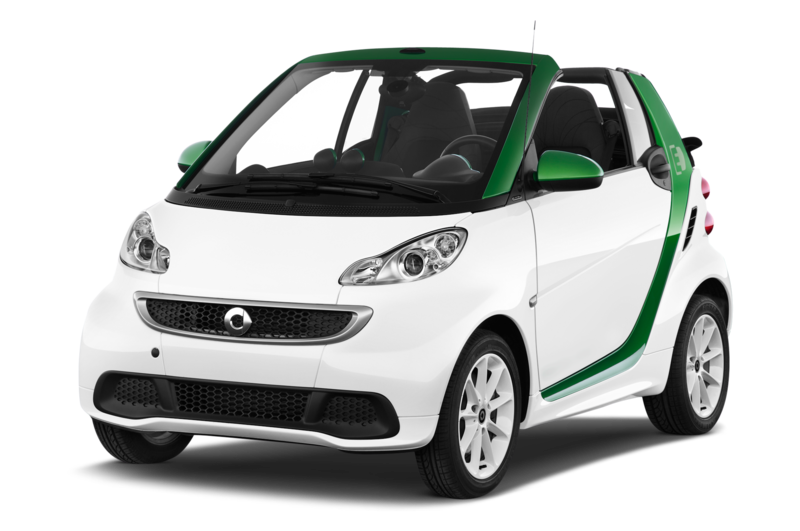 Price will be around $25,000, though tax credits could drop that number to as low as $18,000, depending on where you live. 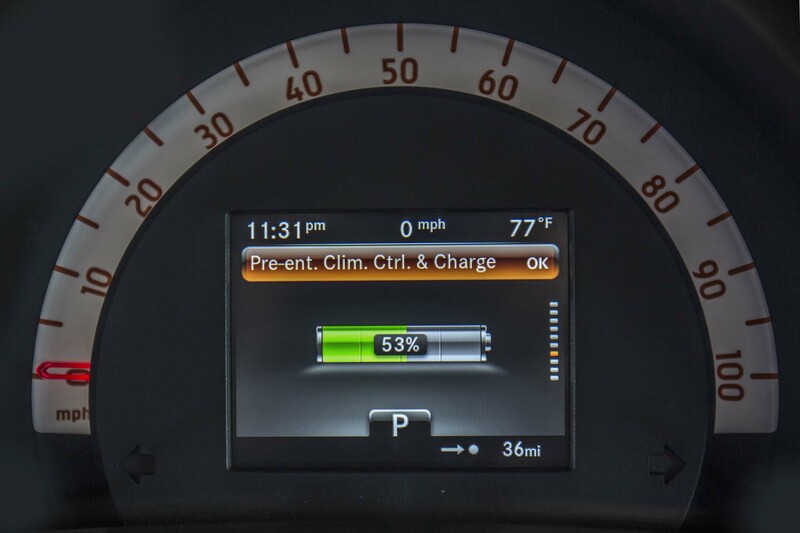 Recharge time when plugged into a 120-volt/12-amp connection is 16.5 hours to full and 13 hours to 80 percent — well beyond a good night’s sleep. 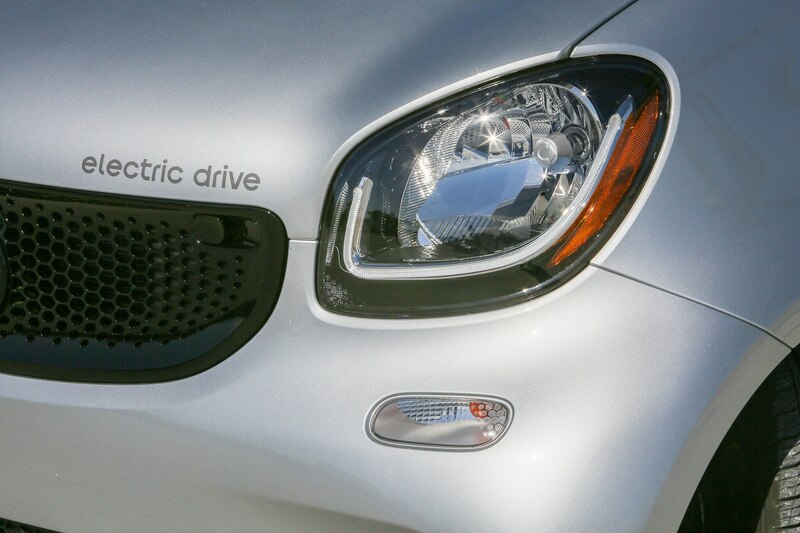 Install a 240-volt/32-amp home box and that falls to 3 hours and 2.5 hours, respectively. 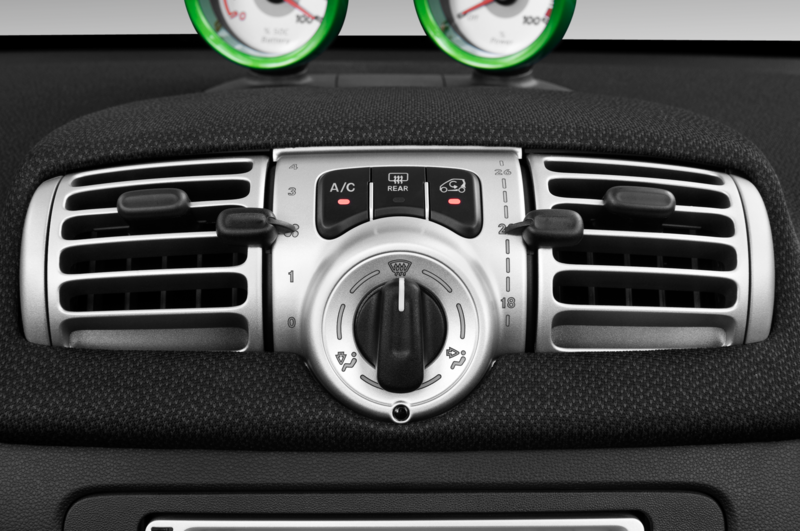 There is no Level 3 charging. 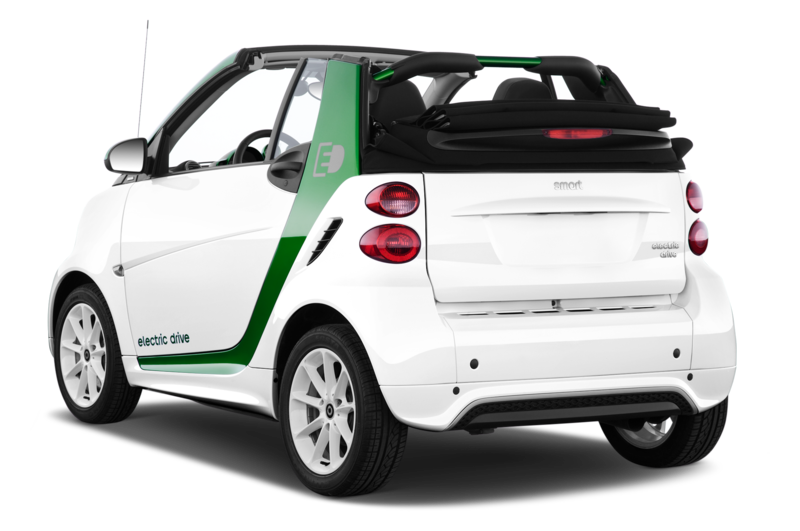 Warranty on the battery is eight years or 60,000 miles. 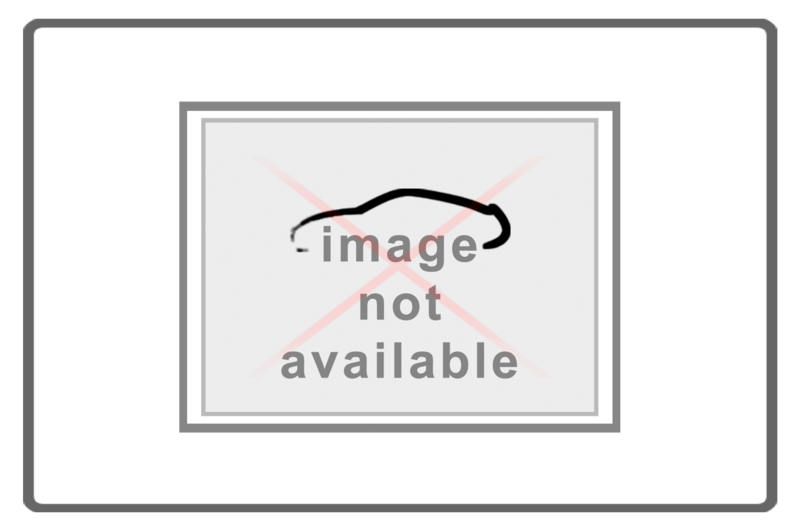 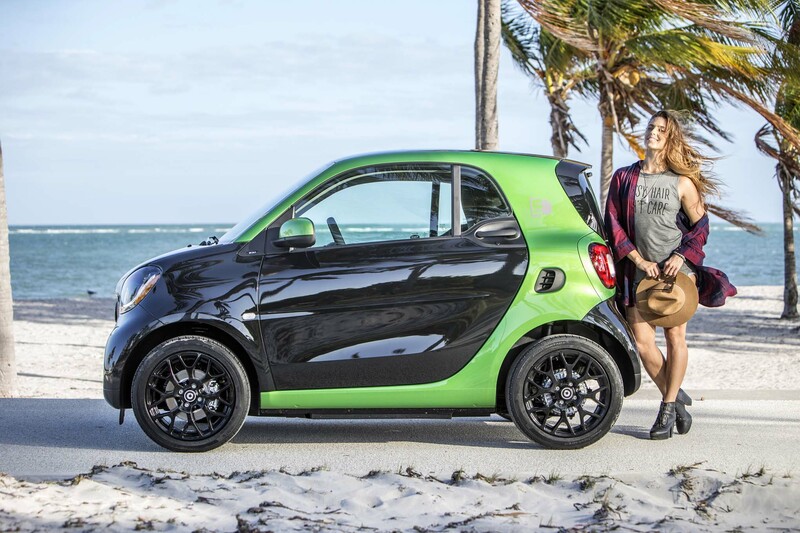 To give you a sense of the third-generation Smart’s size, it’s 1.1-inch taller and 1.4-inch wider, but a full 3 feet shorter front to rear than a Fiat 500e, its closest competitor in the compact EV space. 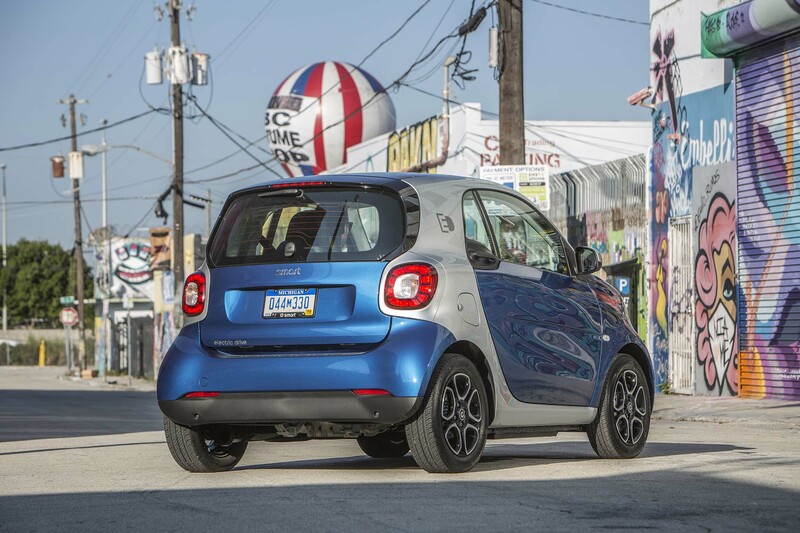 That added width and improved styling make the current model look more like, well, a real car — albeit a city cute one. 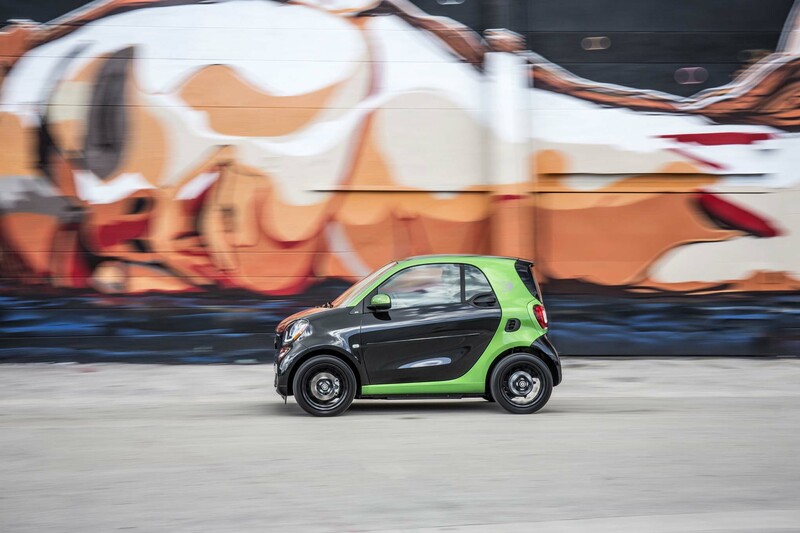 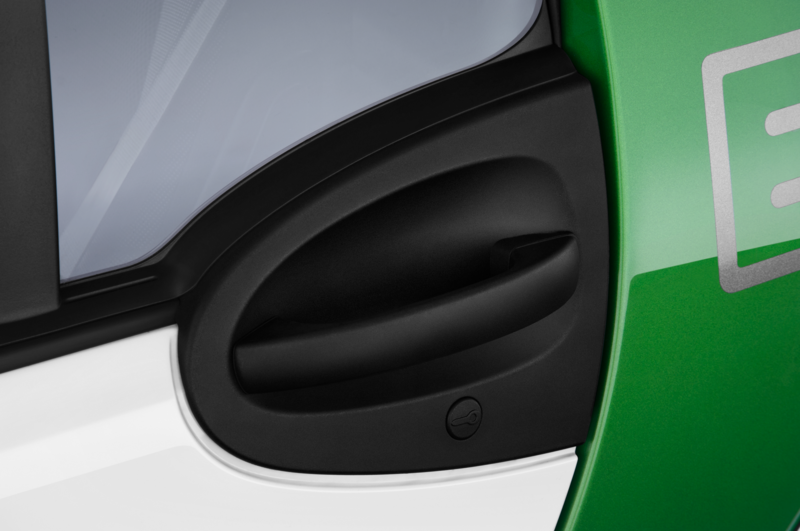 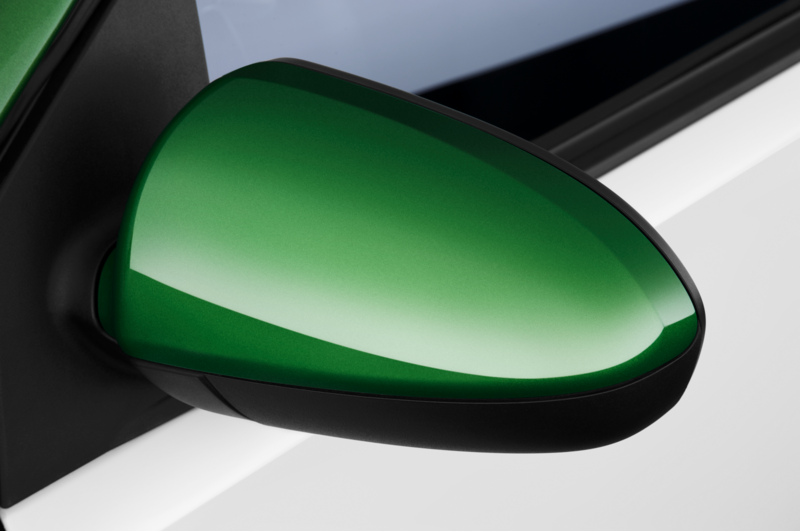 Contrasting with its colorful body panels is Smart’s vaunted Tridion safety cell. 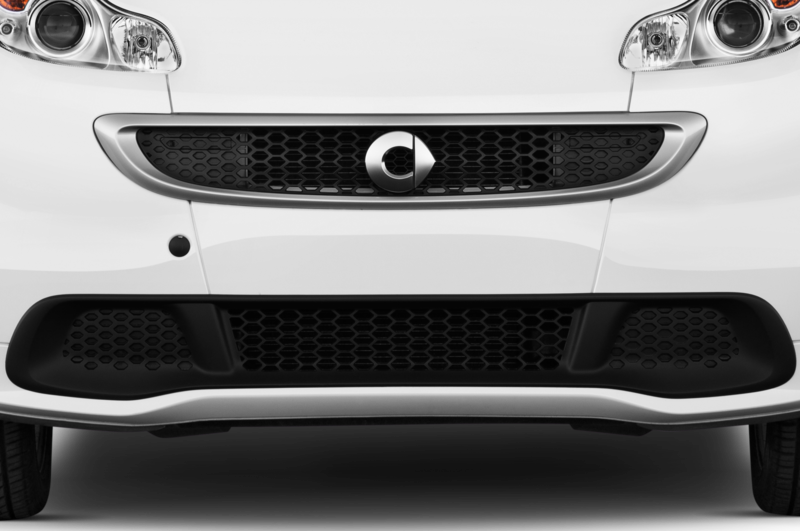 Formed with a mix of ultra-high strength, hot-formed, and maximum-strength multiphase steels, it creates a sturdy cage around the car’s two occupants. 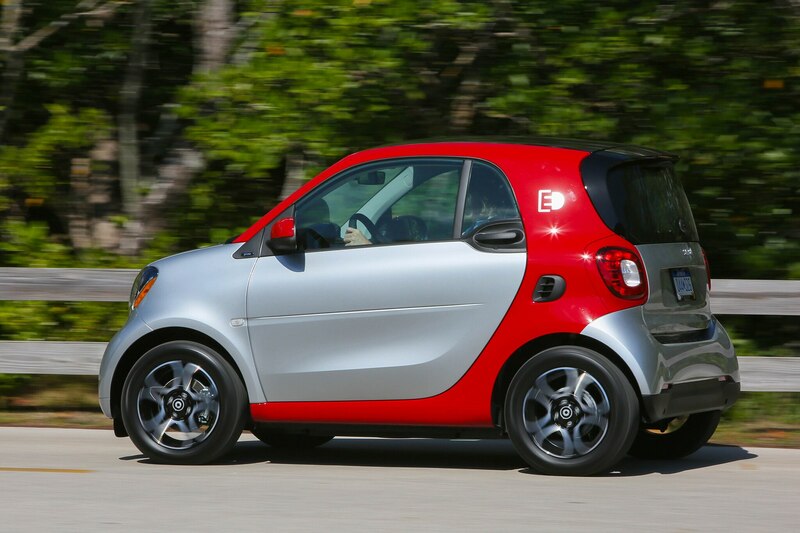 (Check out the YouTube videos of the Smart versus S-Class crash tests. 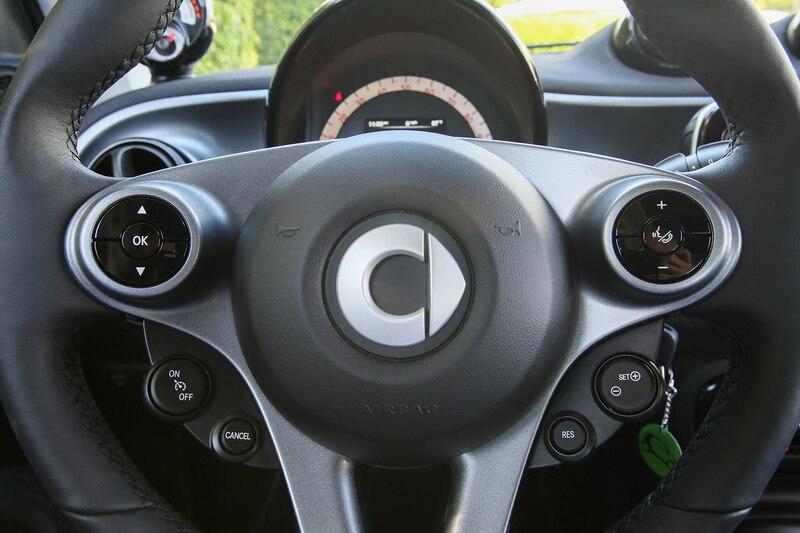 Impressive stuff.) 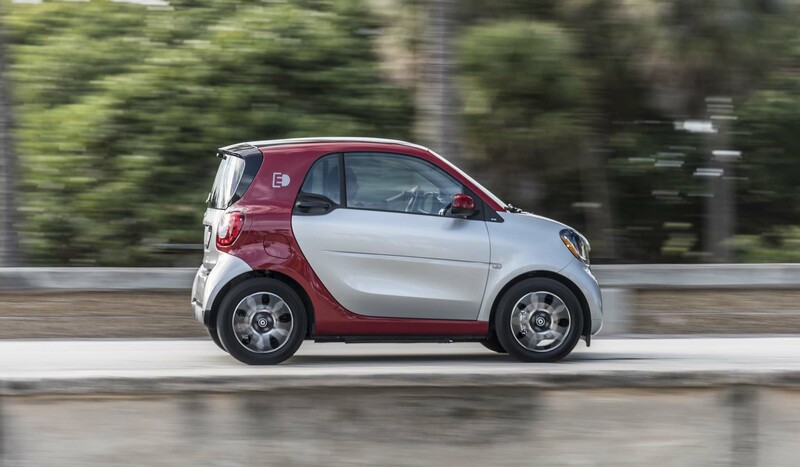 Because in a car as small as the Smart Fortwo, you’ll not only have some range anxiety if you stray too far from your urban core, you could also suffer from some safety anxiety when that giant truck in the next lane suddenly swerves in front of you. 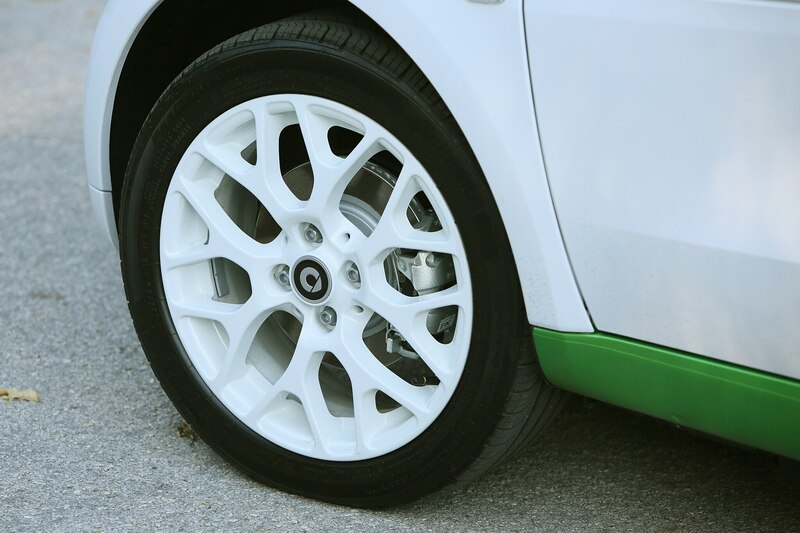 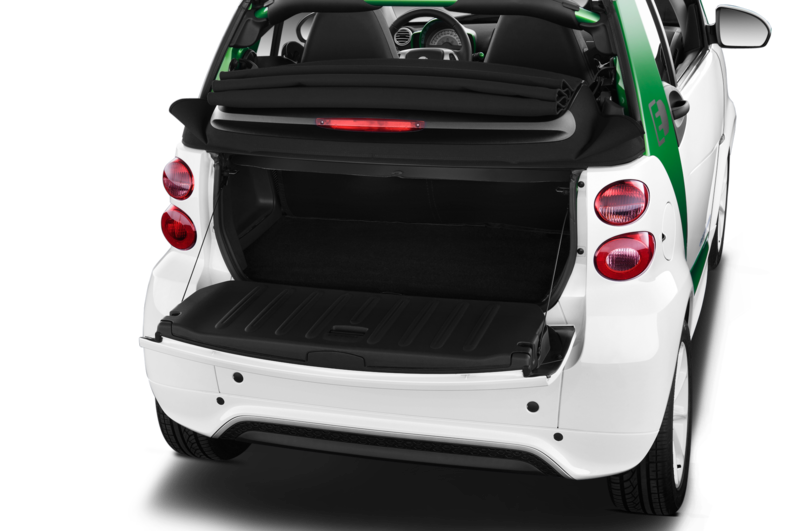 There is also a high-strength steel cocoon protecting the 330-pound, 17.6-kWh lithium-ion battery pack centrally located under the car, helping to lower its center of gravity. 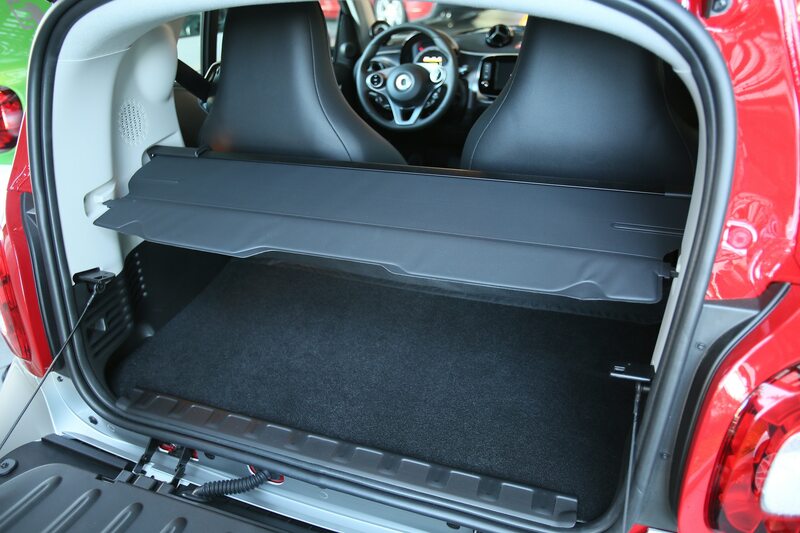 Inside the pack are 96 pouch cells encased in 32 liquid temperature controlled boxes. 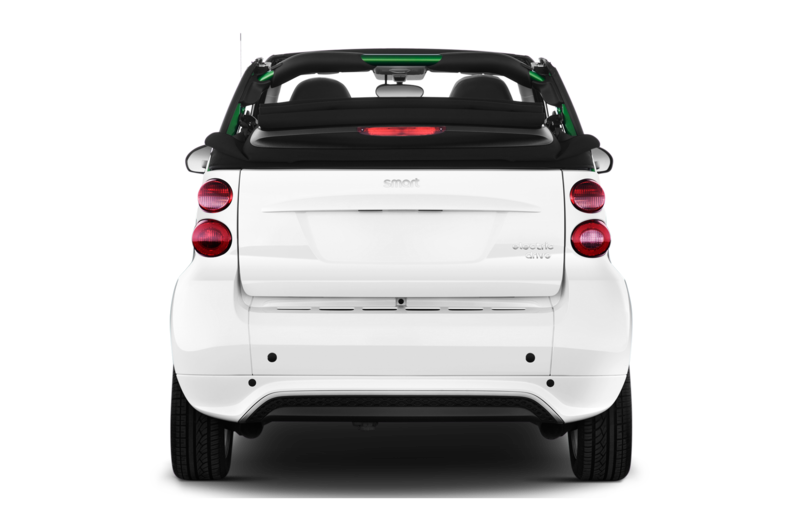 Output from the battery routes to a three-phase synchronous motor and single-stage transmission mounted under the luggage compartment. 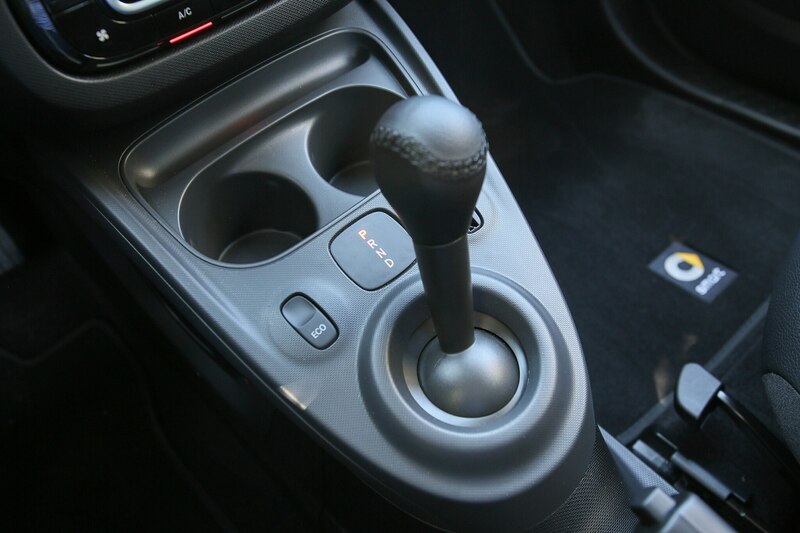 For reverse, the motor just spins in the opposite direction. 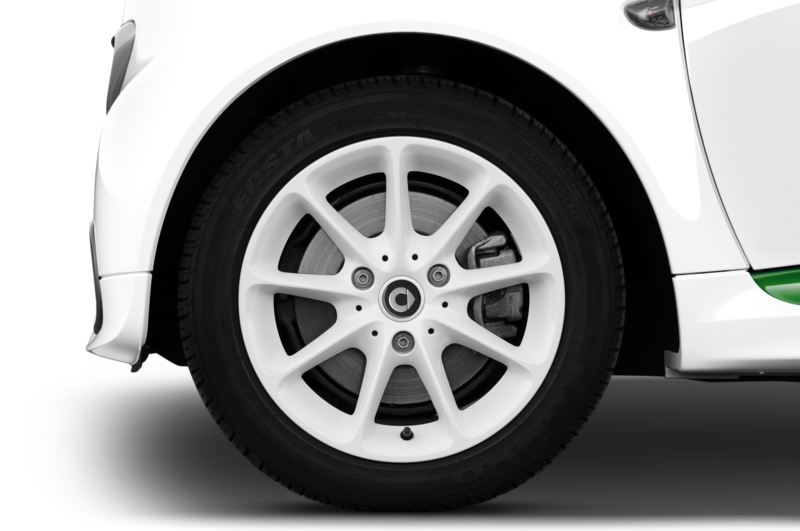 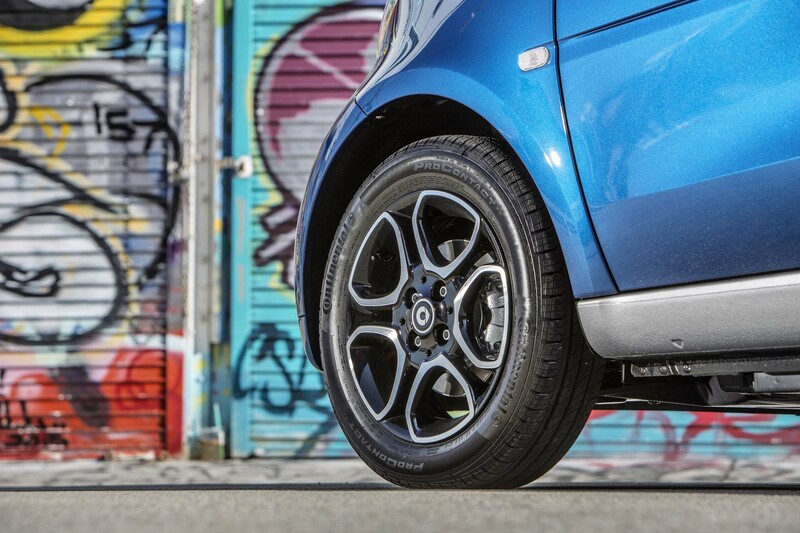 The combo produces a modest 80 horsepower and 118 lb-ft of torque to the rear wheels. 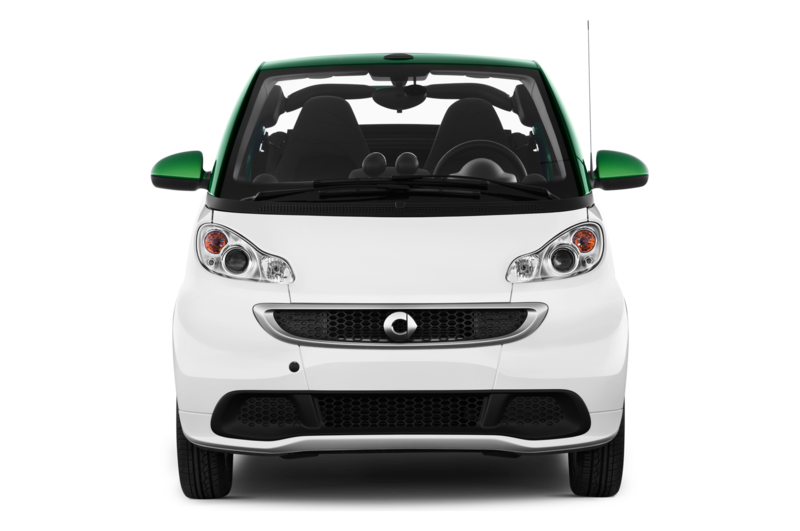 The Smart Fortwo ED glides away from the curb quickly and quietly with the first punch of the throttle given that its torque is available from 0 rpm. 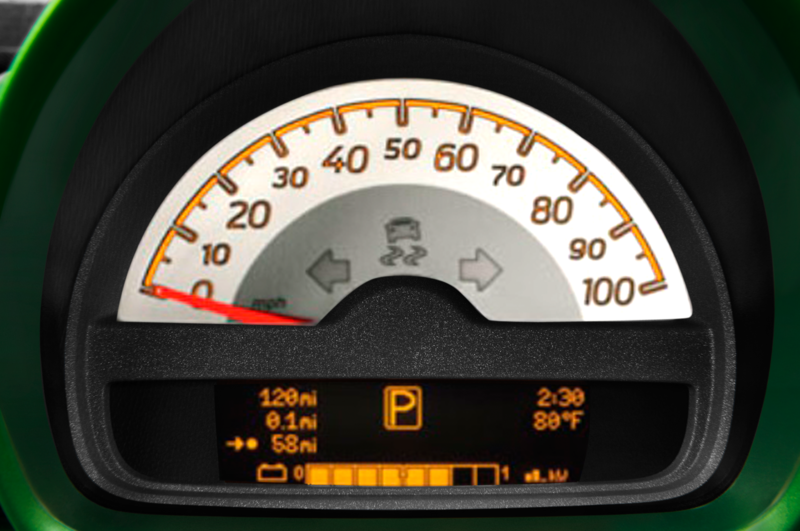 It doesn’t so much accelerate as it does scoot. As with many electric cars, it handily jumps from 15 to 25 mph with an ease that works nicely in city traffic. Guy in the right lane dogging it? 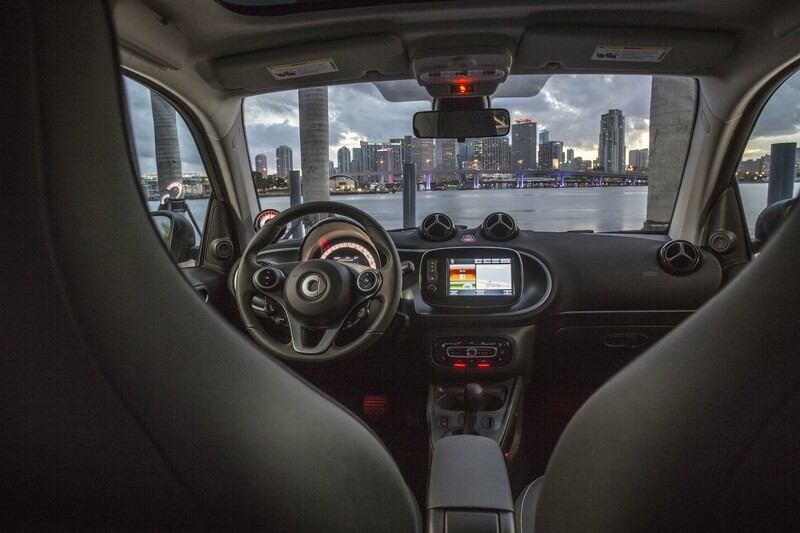 Scoot, you’re in front of him. 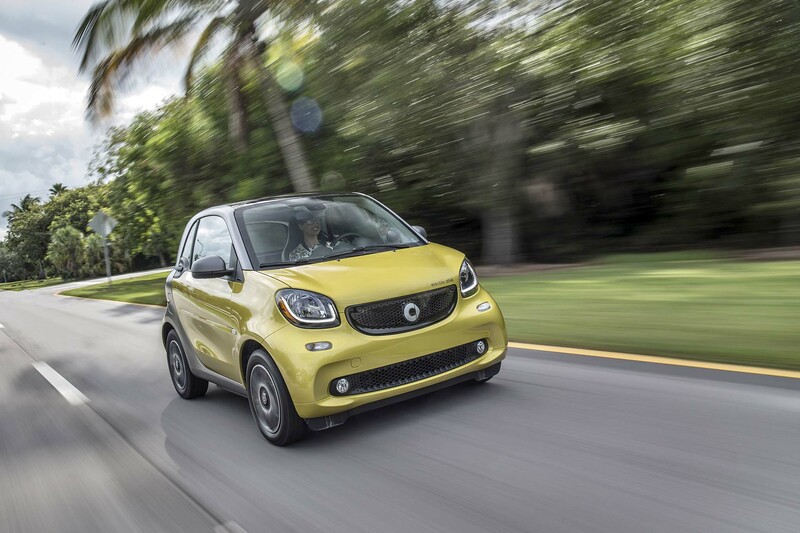 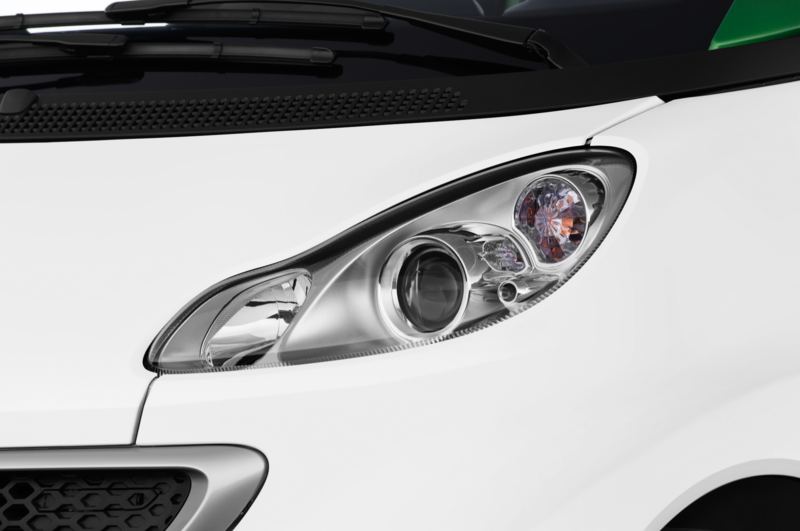 In tight, congested situations, the size and agility of the Fortwo become handy tools. 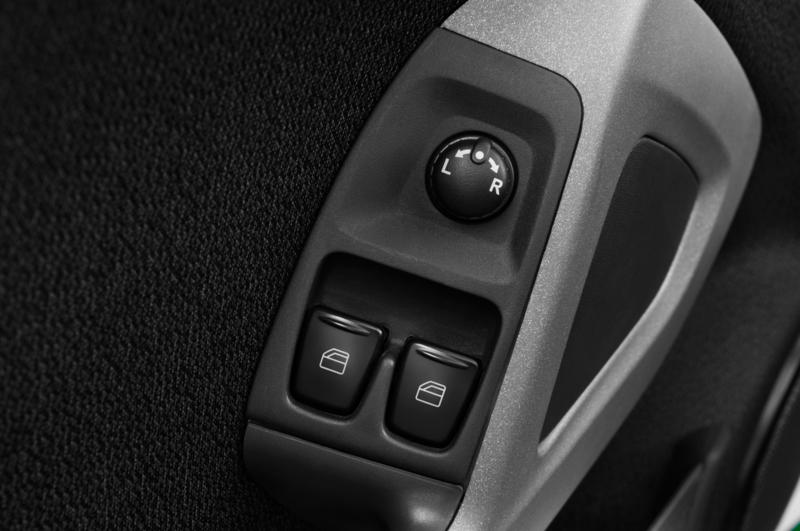 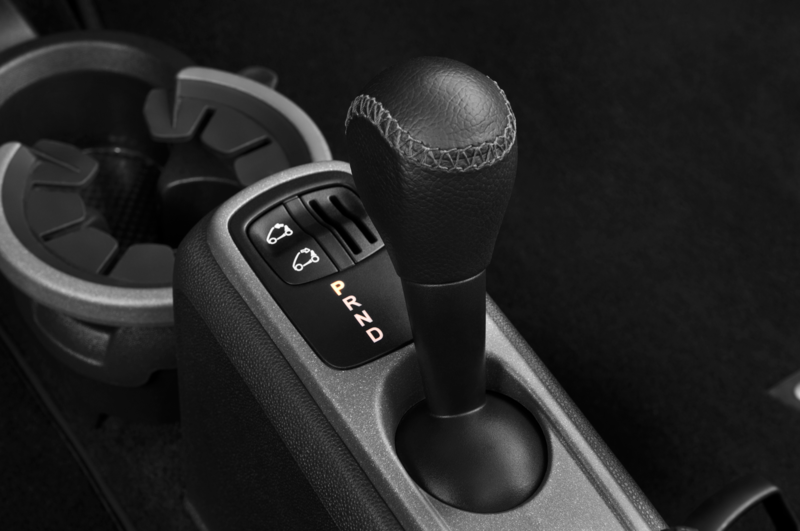 Steering and brake feel fit right in — light and immediate. 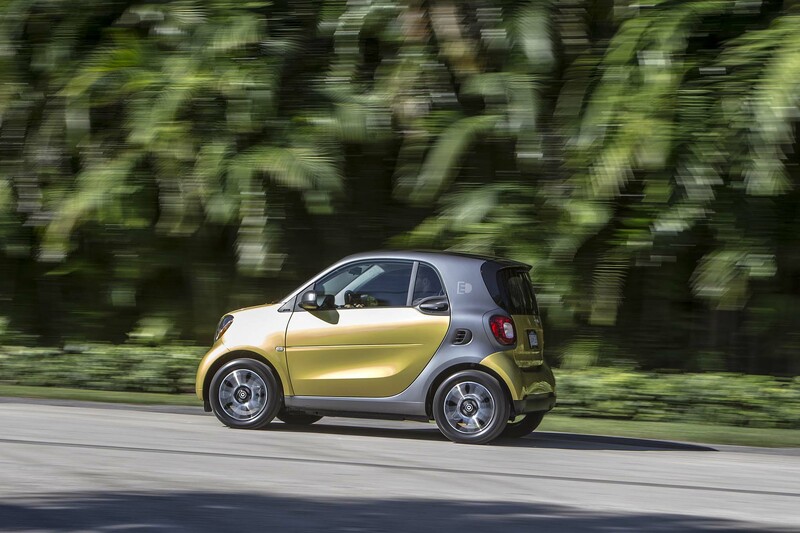 Given the minimal daily mileage requirements of many urbanites, this is where the Smart’s urban-centric storyline works. 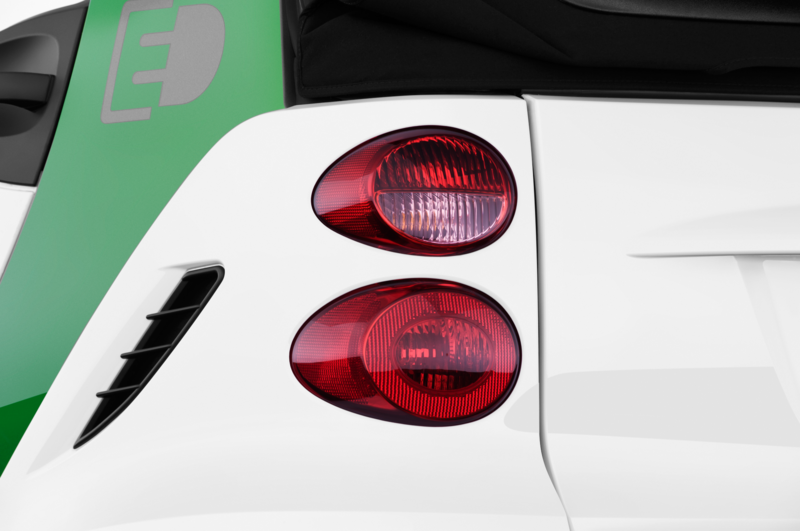 For the hypermiler set, there’s an ECO mode that trims top speed, limits acceleration, and maxes regeneration. 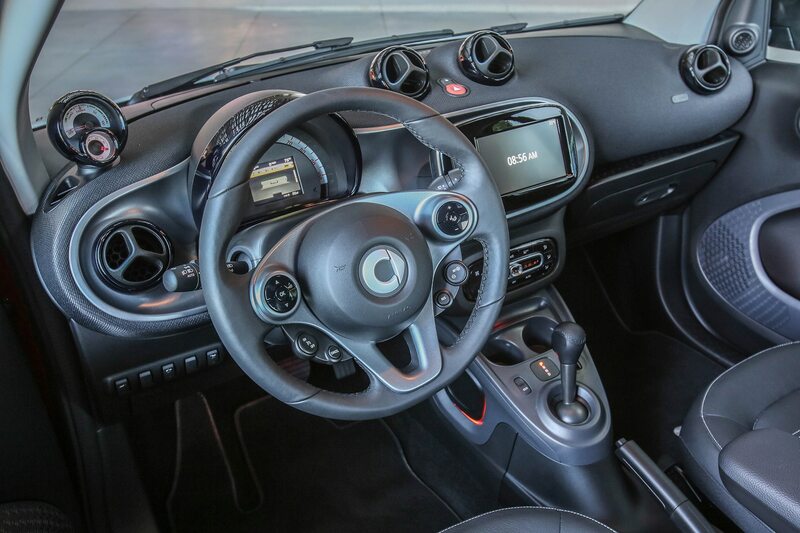 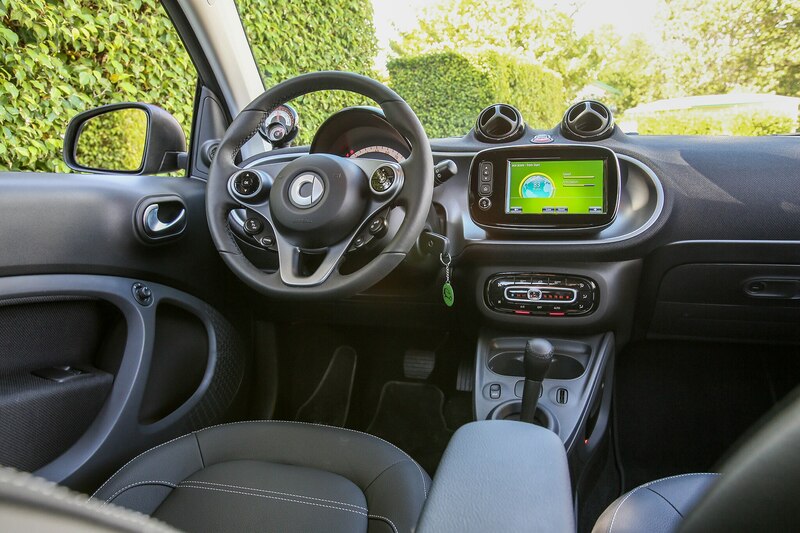 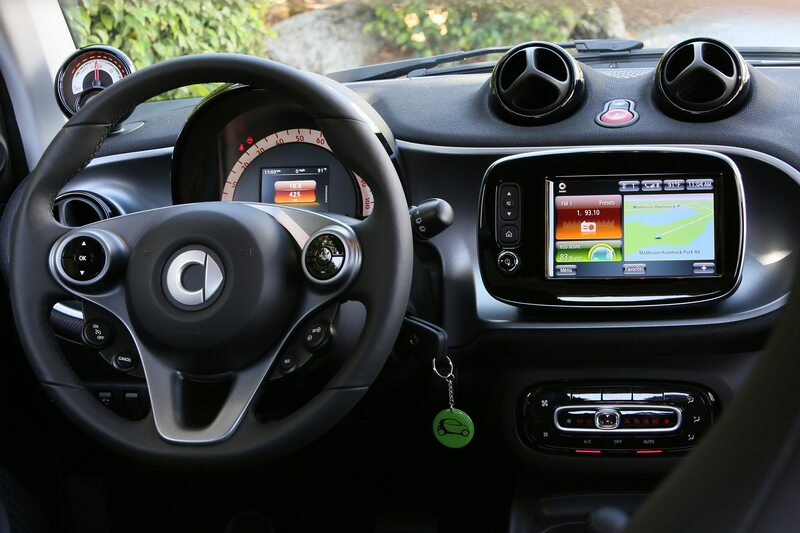 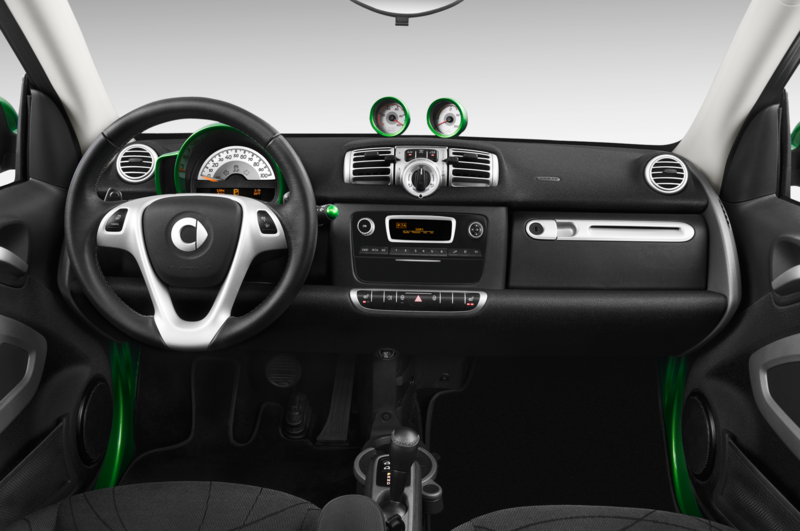 Inside, the Fortwo is reasonably spacious for a pair of 6-footers, with solid, comfortable seats. 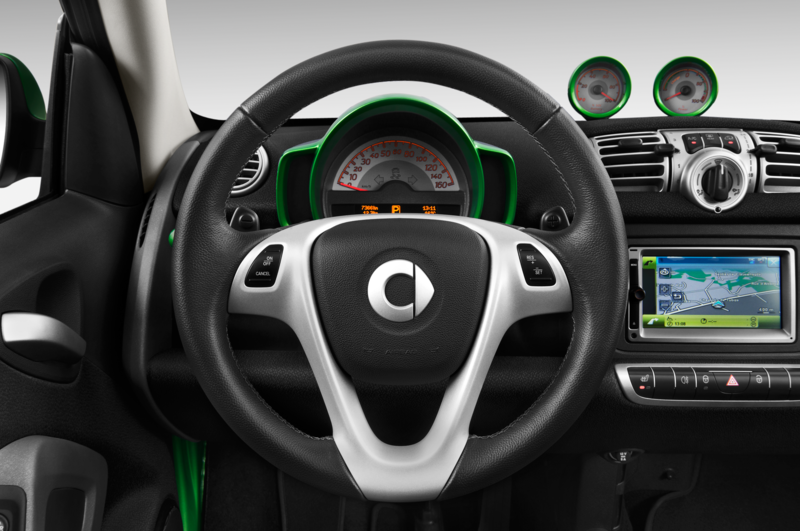 You face a multi-function steering wheel and a hooded instrument panel. 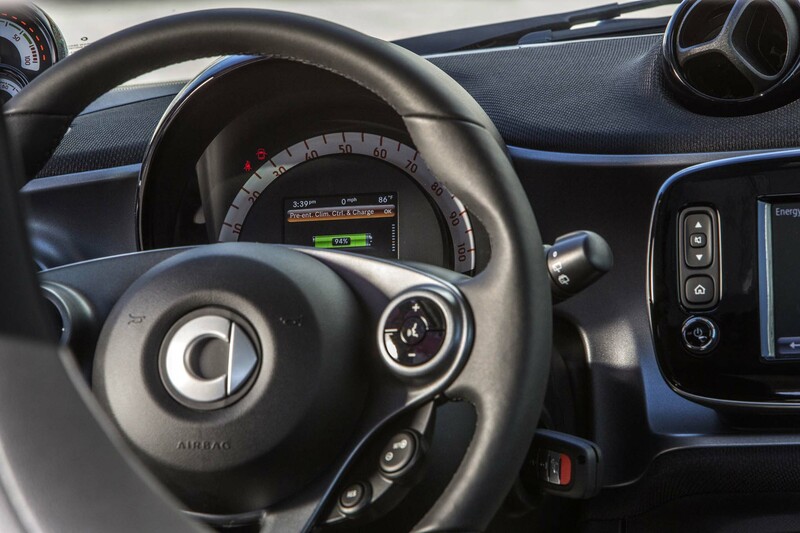 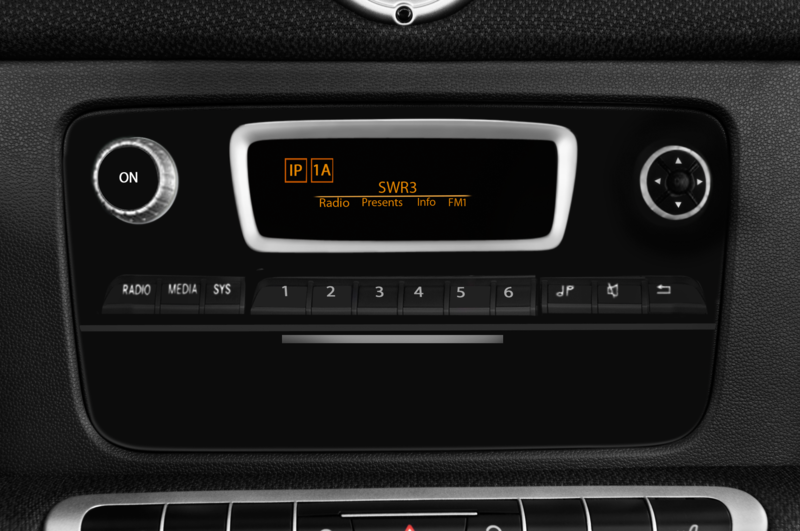 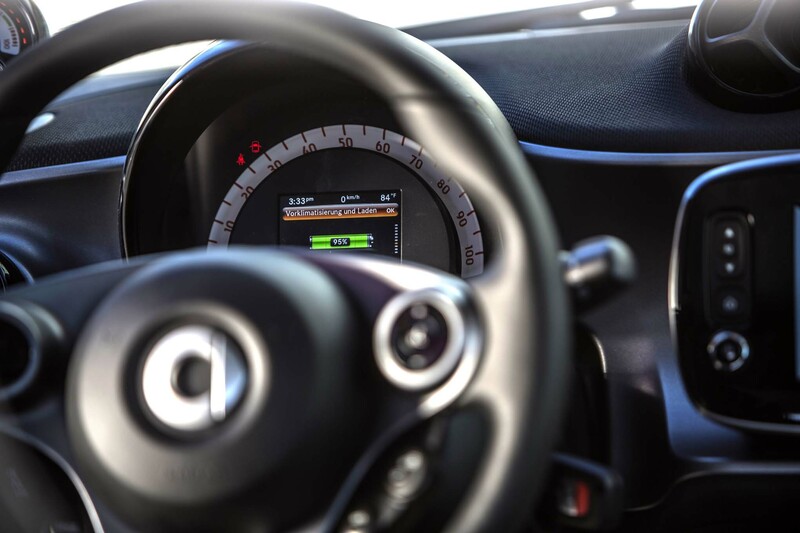 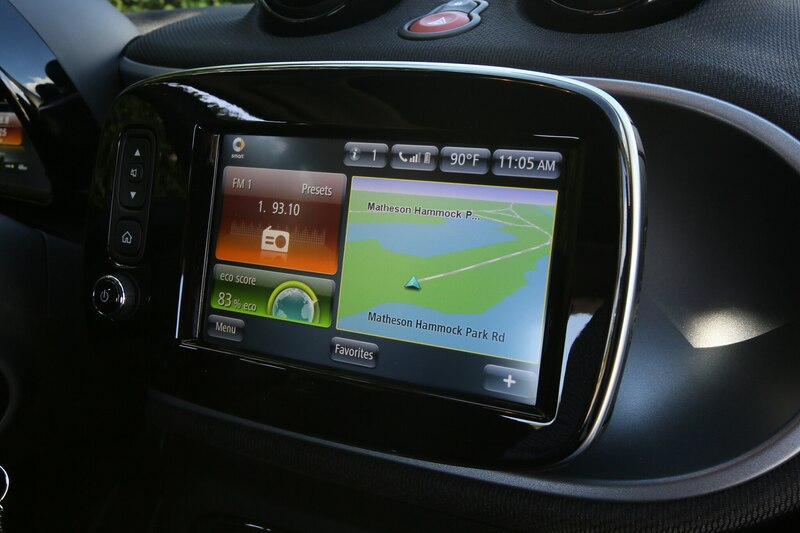 On the top left of the dash is a gauge that spells out energy use and battery capacity and our test cars had Smart’s optional 7-inch navi/infotainment touchscreen setup. 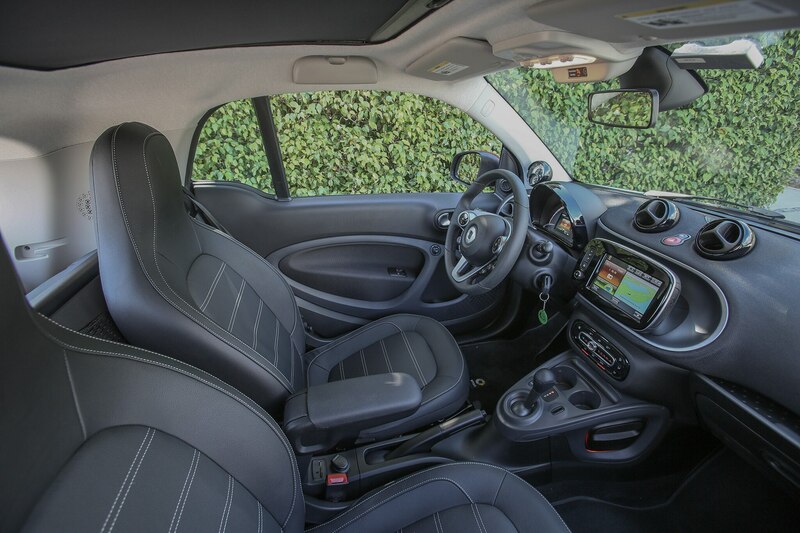 All in all, it’s an environment that’s more usable and livable than it would appear to be from the outside. 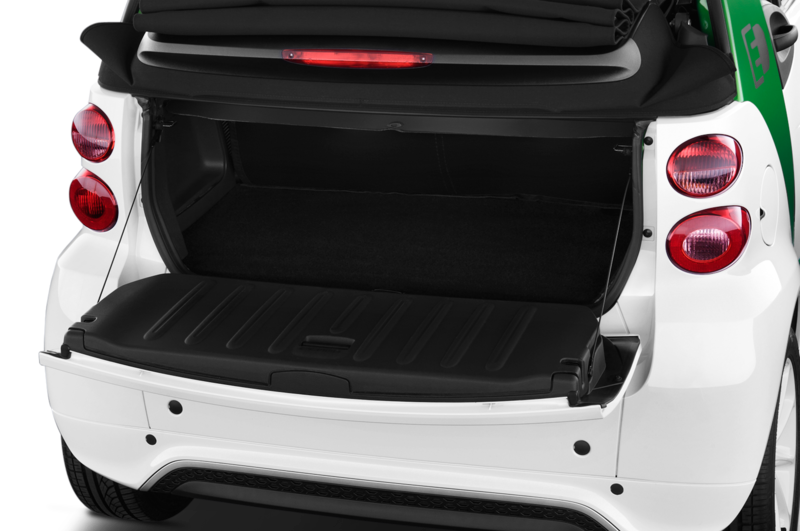 As you’d expect, cargo space is minimal but big enough for a couple of small bags. 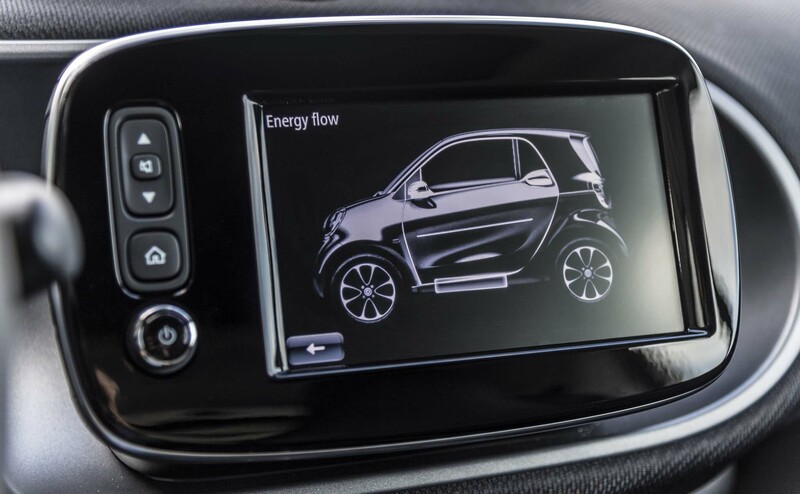 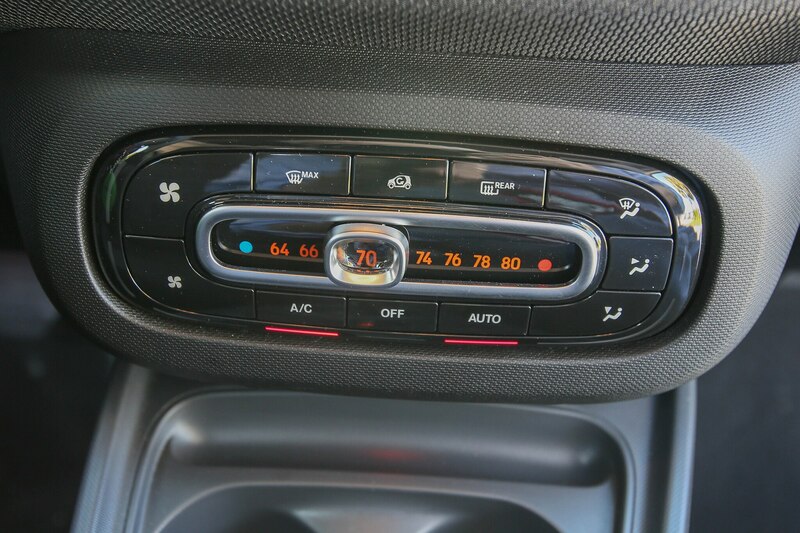 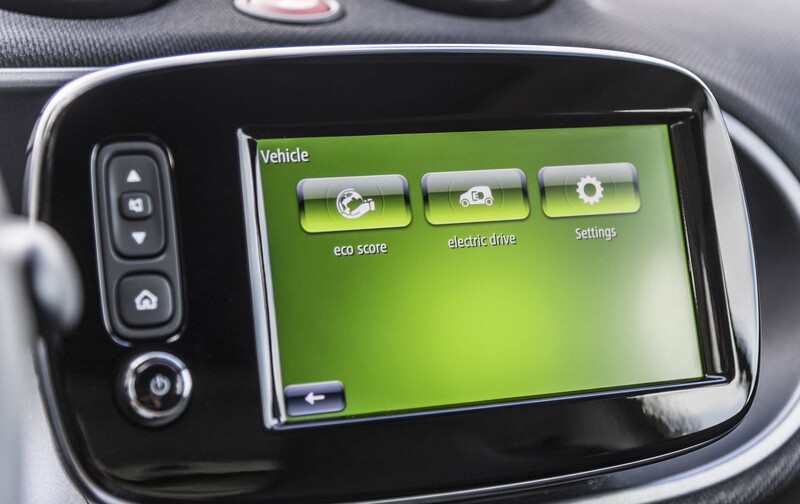 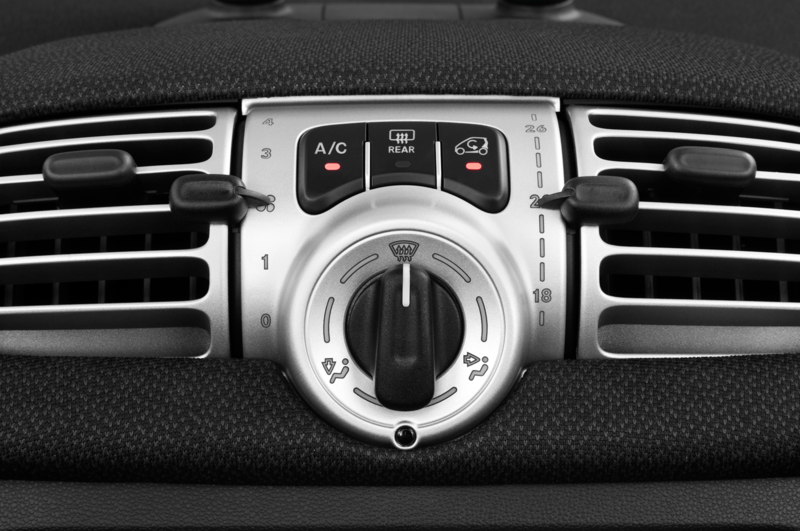 Naturally, Smart offers an app that lets you control functions, such as when the battery is charged to having the car’s interior pre-heated or cooled while the ED is plugged in, which helps save range. 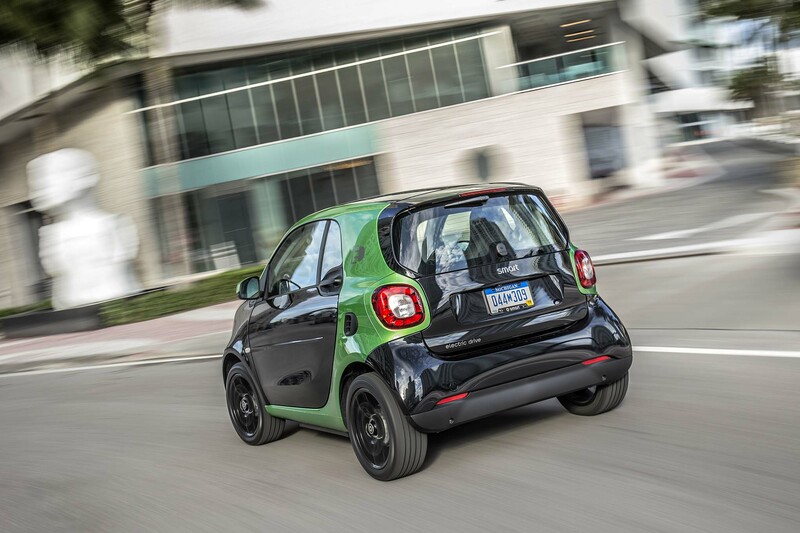 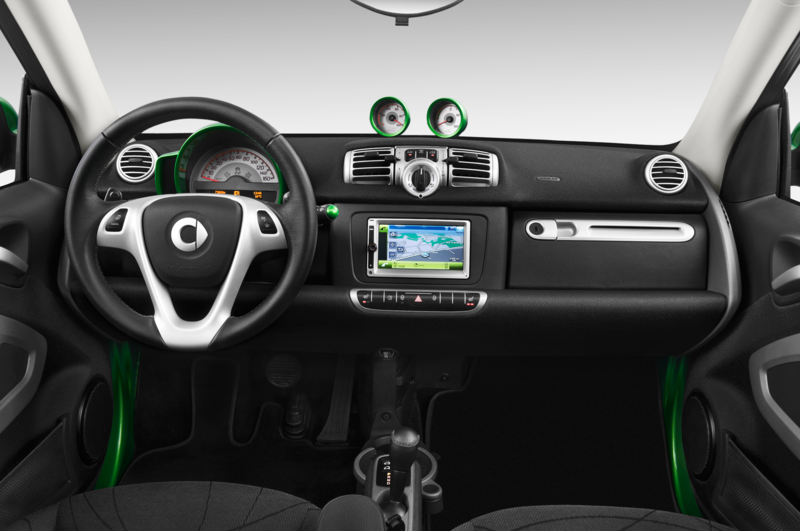 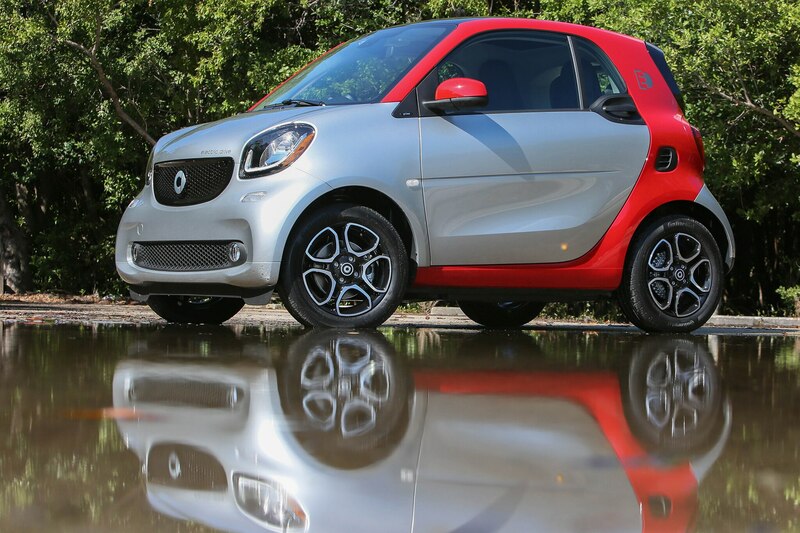 And given that Smart is a division of Mercedes, the option list for the Fortwo is extensive, with much of it having to do with colors of the body panels and the safety cell. 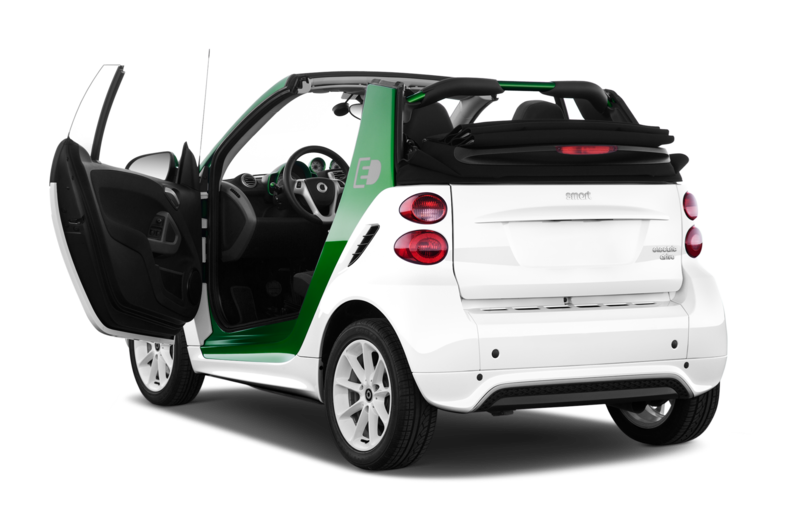 You’ll have a chance to sample the 2017 Fortwo ED next spring if you like the hardtop or come summer should you prefer the cabrio. 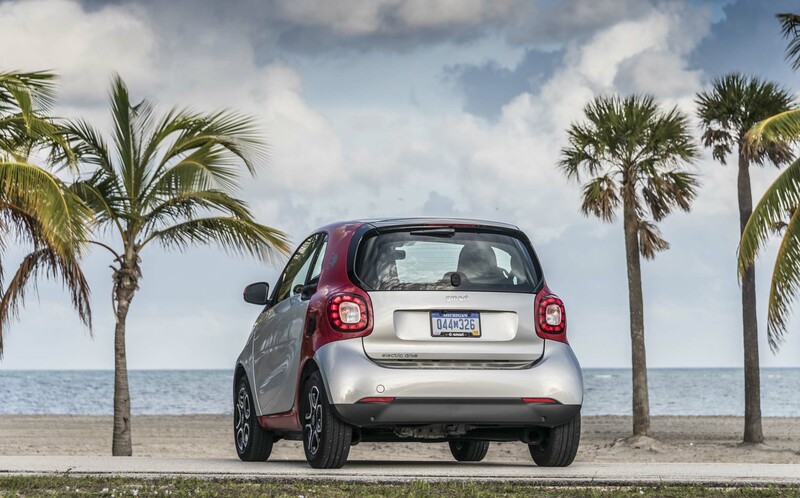 While a Chevy Bolt makes a lot more sense if you live in Lolo, Montana, or Marfa, Texas, in big cities like Los Angeles, Atlanta, or Miami, the Smart could be the, um, smarter alternative, especially given its price and attributes.